I woke up before the sun rose on Friday morning, unable to get back to sleep. It wasn’t anything terrible, my body has been used to waking up early on this trip. 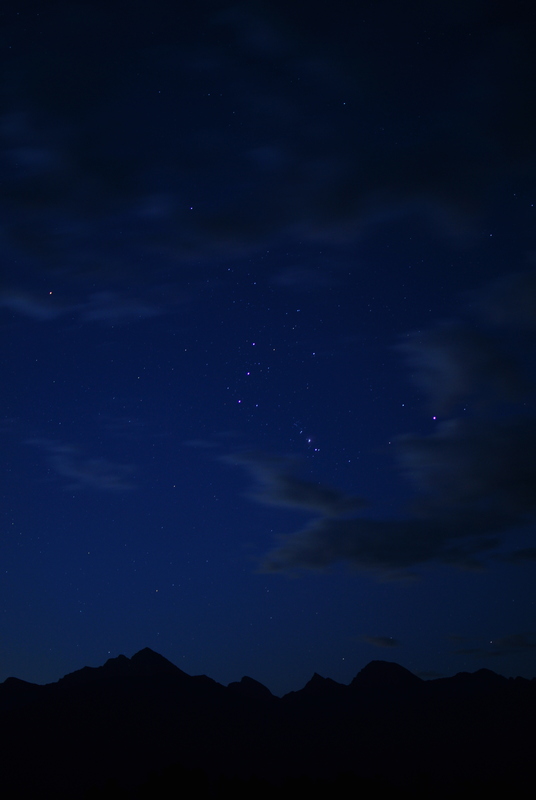 And it was a good feeling to know that it was one of the last few nights I would be sleeping in the car – I knew in Texas I had a bed to sleep in, as well as points back east. I made my way towards Oklahoma City. On the way I hit up a Flying J truckstop for a shower (probably another “last time” thing for this trip), worked on the site a bit, then afterwards I continued towards the city. If you recall, I drove through the city before (earlier in the trip enroute to Texas), but I didn’t stop because it was pretty rainy. 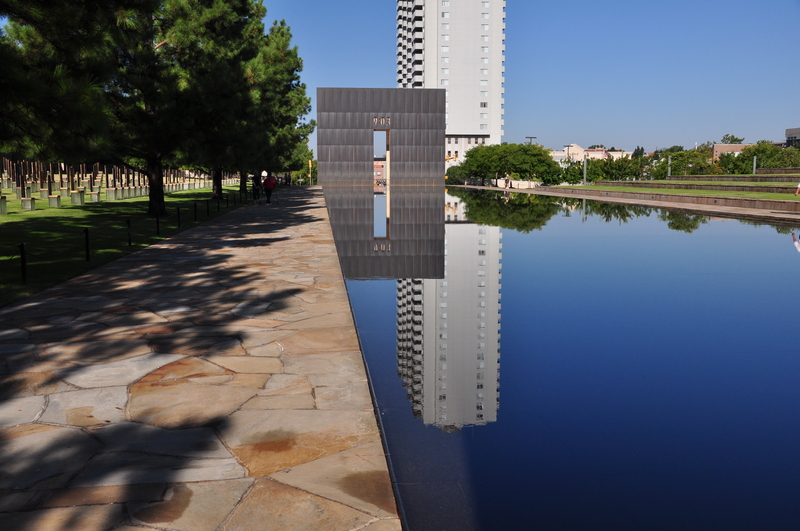 This time the weather was clear and I wanted to visit the OK City Memorial. 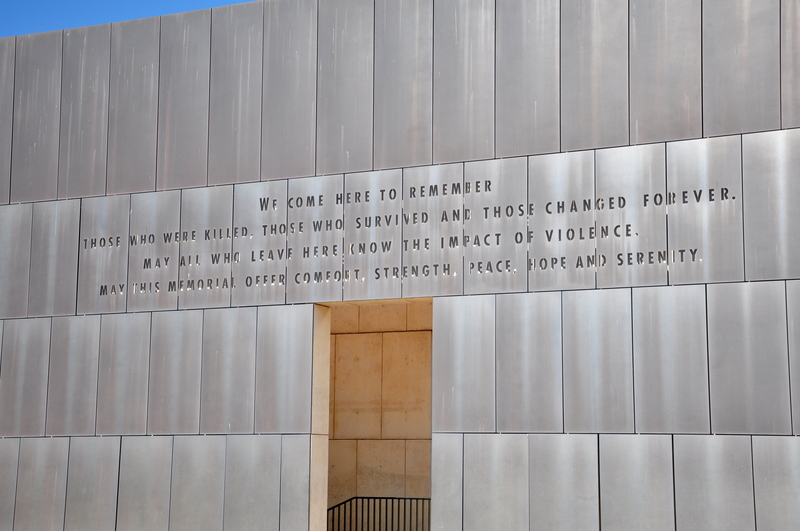 I think the memorial here was incredibly beautiful and well thought-out. It’s a very peaceful place. From the vantage point in the above photo, you can see stone chairs on the left-hand side. 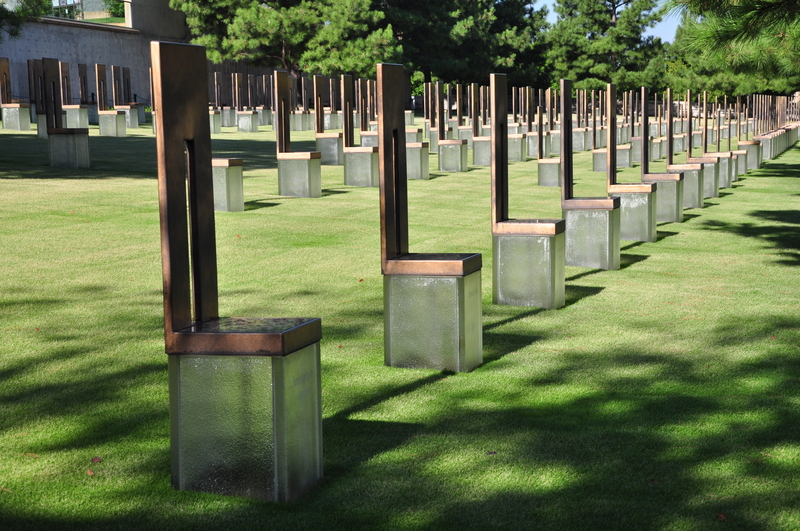 These were organized in nine rows, symbolizing the nine floors of the Alfred P. Murrah building, with each chair representing a person who died on their respective floor – 168 chairs in total. Each chair is marked with a person’s name, and you’ll notice there are some smaller chairs that represent children who died in the bombing. Very sad. I feel the memorial here did a good job in helping people remember what happened 15 years ago, and recognizing all the innocent life lost. 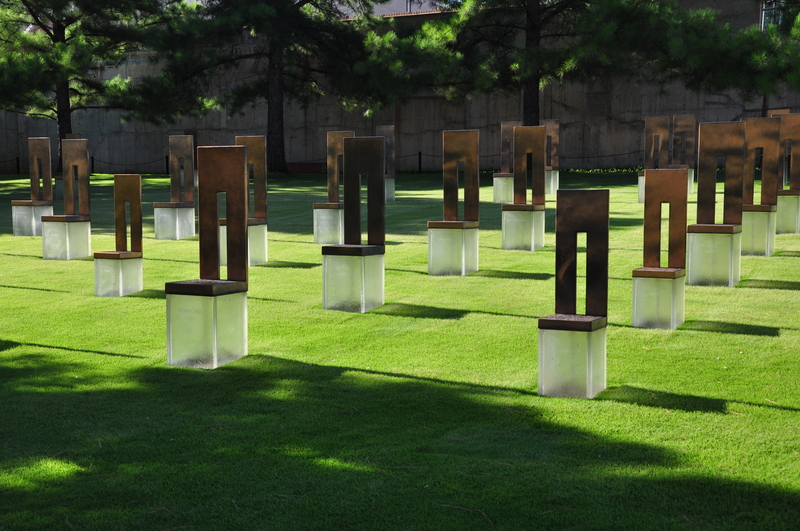 I’m thinking if the Sept. 11 memorial at Ground Zero can be approached with the same mindset as the OK City Memorial, it will be a serene place. 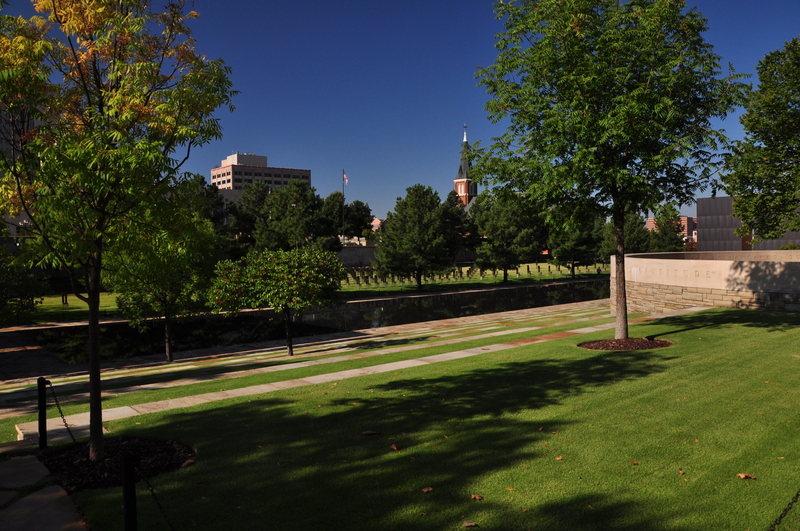 From Oklahoma City I continued my journey south towards the Dallas/Fort Worth (DFW) area. I arrived just around 1PM when I planned to meet up with my friend Ame for lunch. She brought her cute kid, Aidan. 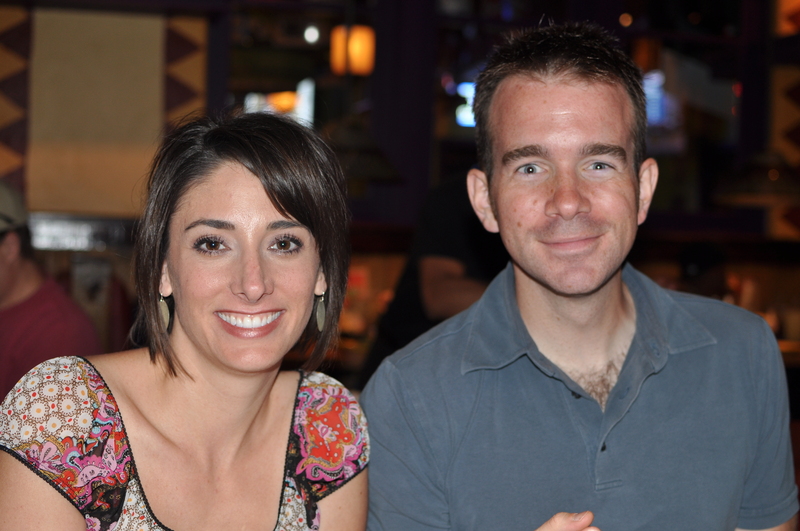 Enjoyed a nice lunch with these two, and then I was back in the car to drive the short distance to my friend Rich’s house. Rich offered me a place to stay in his gorgeous new home (and, like two times earlier in this trip, I got to be the first-ever houseguest). 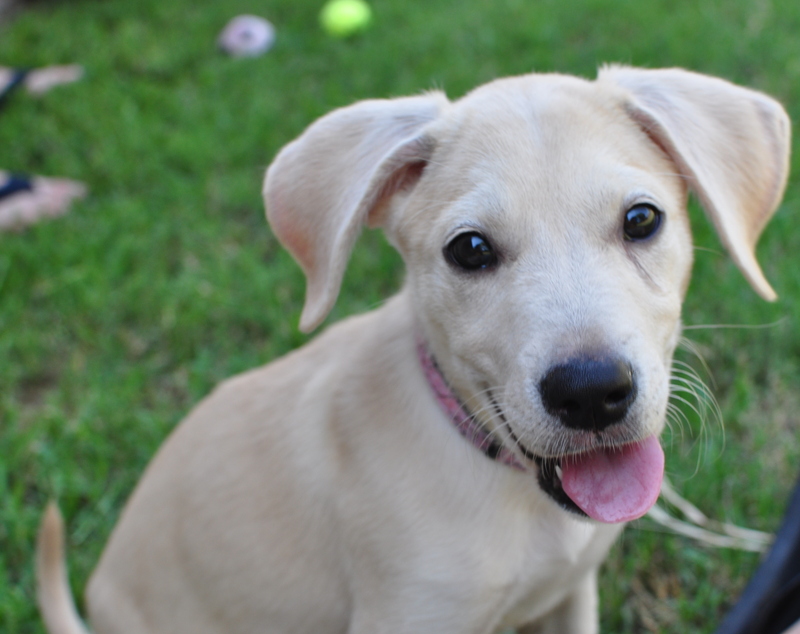 I dropped off my things and eventually headed over to Kelly’s home, 10 minutes away, and met the puppy she just got, Bella. Rich, Kelly, and I later headed downtown to a happy hour and I got the chance to meet up with some Lockheed friends. 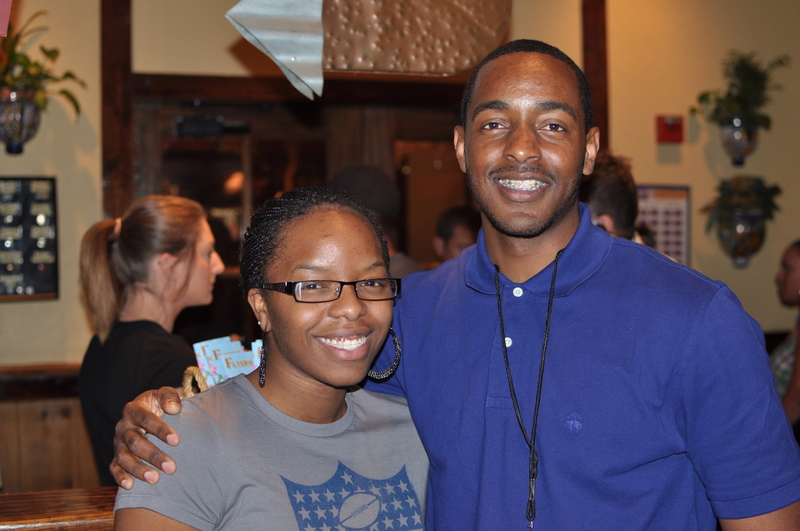 I ran into a few faces I hadn’t seen in several months, and some probably in over a year’s time. 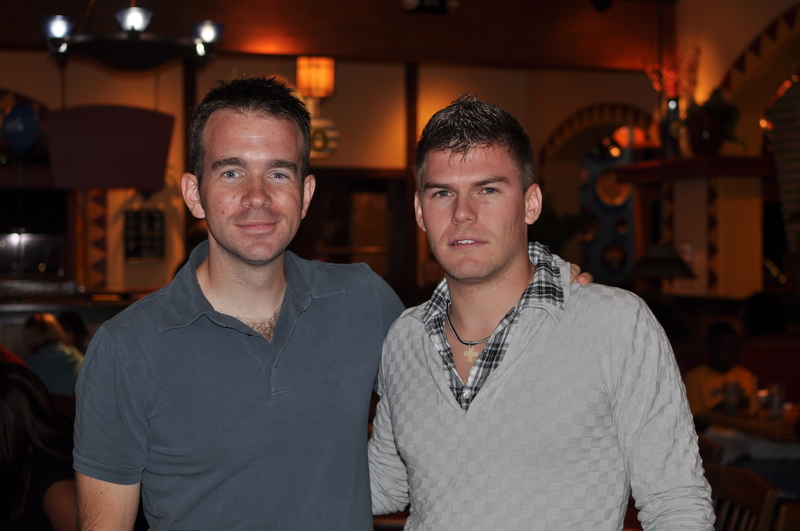 One big surprise was meeting up with a buddy, Vic, who took over a job from me back in Maryland. I couldn’t recall if I knew he moved down here, but it was pretty funny to look up at one moment and then you say “Holy crap, what are you doing here?” Fun times. From there we went to get a bite to eat at Jake’s Burgers. 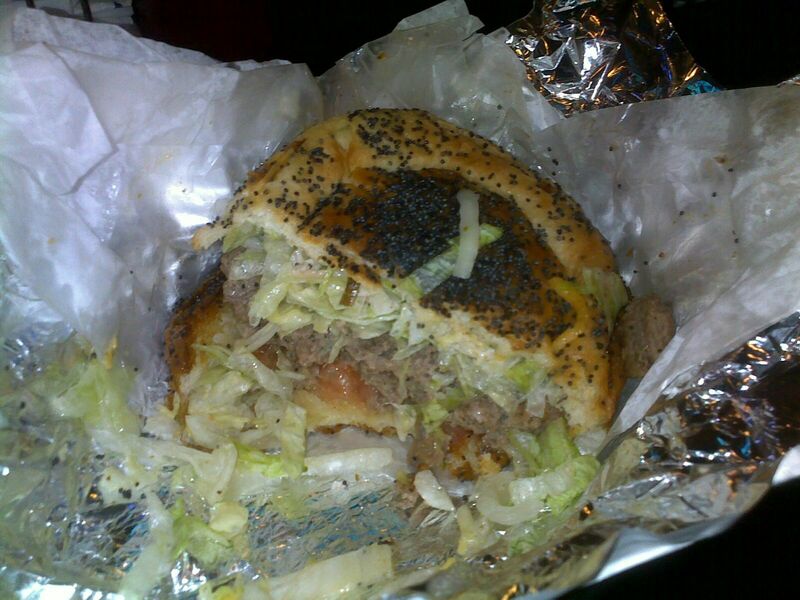 It’s been a while since I had a burger and this one didn’t disappoint. Great night being back here in Texas with friends. 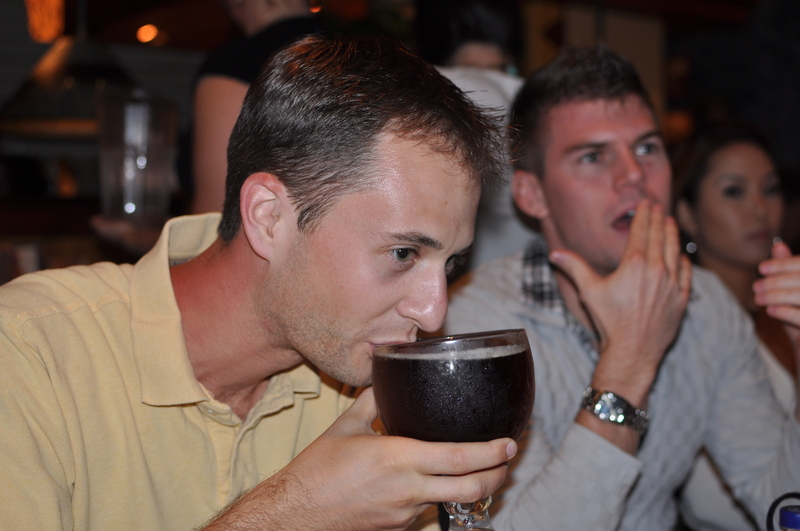 The next day, Saturday, was devoted to meeting up with more friends in the area. But earlier in the day, Rich volunteered to help with the car and see if he could figure out the headlight issue. Turns out, the wiring wasn’t bad, but the bulb on the driver’s side was, so Rich easily replaced the bulb and helped save me a lot of money in the process. Thanks a lot, Rich. In the afternoon Kelly brought Bella over to Rich’s house to play for a bit and I was able to grab a nice shot of this cute 2-month old puppy. 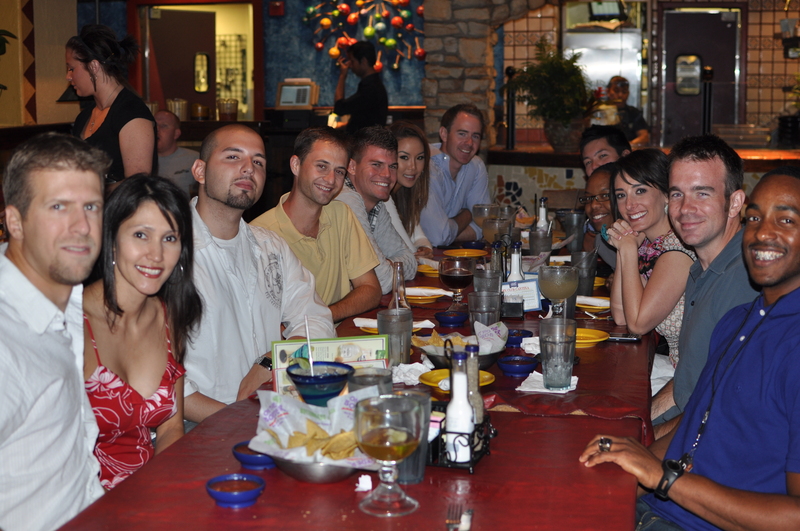 Later that night we got a bunch of friends together at a mexican place in Fort Worth for dinner. 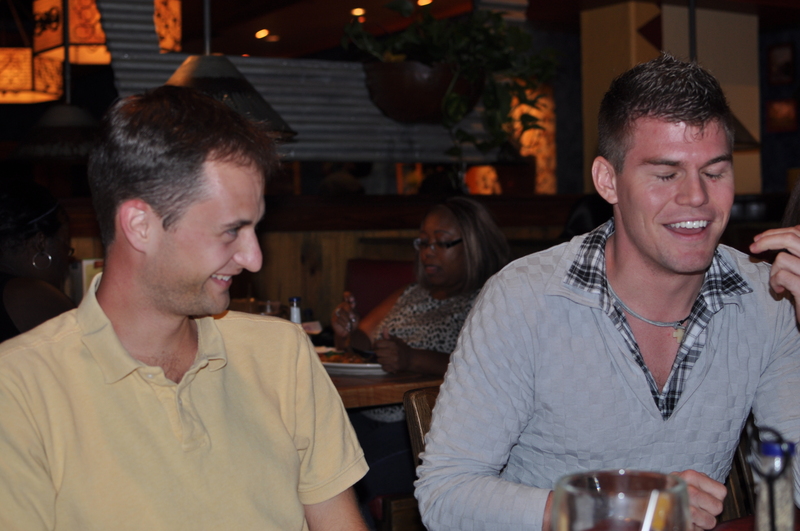 I was fortunate to have friends come down from all over and we had a pretty big group for dinner. Some friends I had seen on the last swing through the area back in early-July, and others I hadn’t seen in a long time. Great to get everybody together. Rich and Brian, about to eat his fingers? Rich and I met Dan and his girlfriend, Andie, downtown at a rooftop bar that had some nice views of the city. Although the temperature was probably in the 90s, a nice breeze up high helped keep us cool. It was a great night. My last full day in the area was Sunday, and I spent some time hanging out with Kelly and then Rich one last time before hitting the road. Thanks again to Rich for letting me crash at his place. I drove to Dallas to hang with Thais for a while, and Monday morning I will hit the road and head east. It’s about 13 hours or so to the Atlanta area, so I’ll take my time driving over the next two days. Had a good reunion with friends down here in Texas, and looking forward to the same back in another one of my “second homes” in this beautiful country. On Wednesday morning I got in a quick swim at the hotel pool before getting everything together for checkout. Around 11AM I was in the car, but I needed to take care of a few things before I traveled east towards Kansas, one of those being an oil change. If I calculated correctly in my head, the oil change I got in Boulder might be the penultimate oil change for this trip. Only one more left. That’s hard to believe. By early afternoon I was on I-70E towards Kansas, but it would be a few hours before crossing the Colorado/Kansas border. I was a little startled by the terrain in eastern Colorado. Not much longer I was driving amongst the plains of Western Kansas. I’ve talked to a number of people during this trip about their past roadtrips, and nobody spoke highly of the drive here. Just flat as far as the eye can see…farmland on top of farmland. I remember being surprised by how flat Florida was, but I think Kansas might take the cake. On Wednesday evening, just around dusk, I was driving along (at the speed limit) and saw two cop cars next to each other on the median. 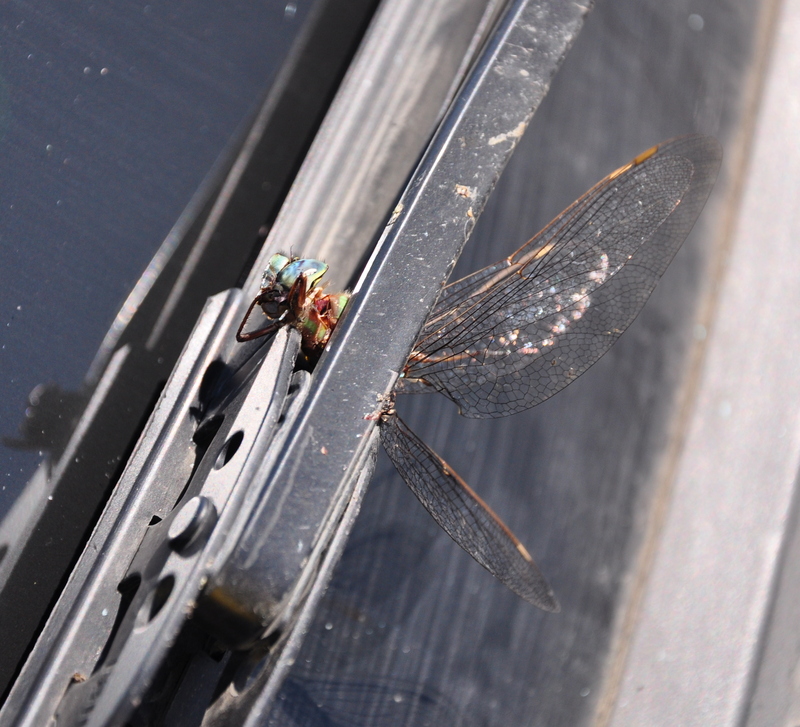 One of them closest to my side started moving before I even passed by, and I was subsequently pulled over. I was wracking my mind to figure out what I had done wrong…wasn’t speeding, and I wasn’t following anybody closely, so I was a little confused. 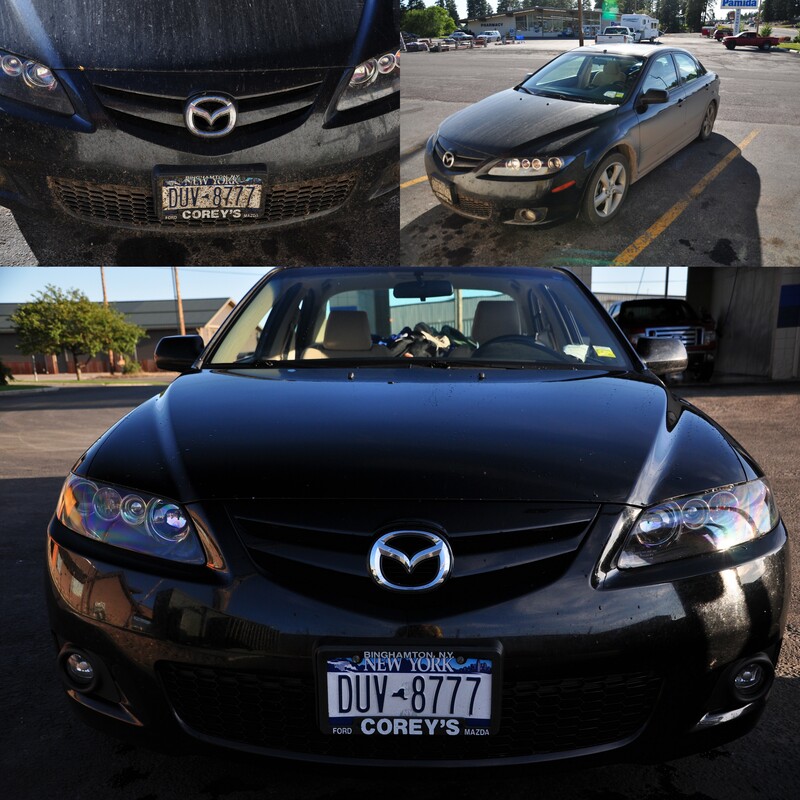 When the officer came out he informed me my driver’s side headlight was out. “What! ?” was my mental reaction. If you recall, I had just gotten the bulb replaced when I was in Alaska. The officer took my information and went back to his car. I was hopeful I wouldn’t get a ticket; I was planning a response if he came back with one – showing the receipt of a new headlight from less than 5,000 miles ago. Looks like I might have some kind of short in the wiring. Thankfully, the officer just gave me a warning. 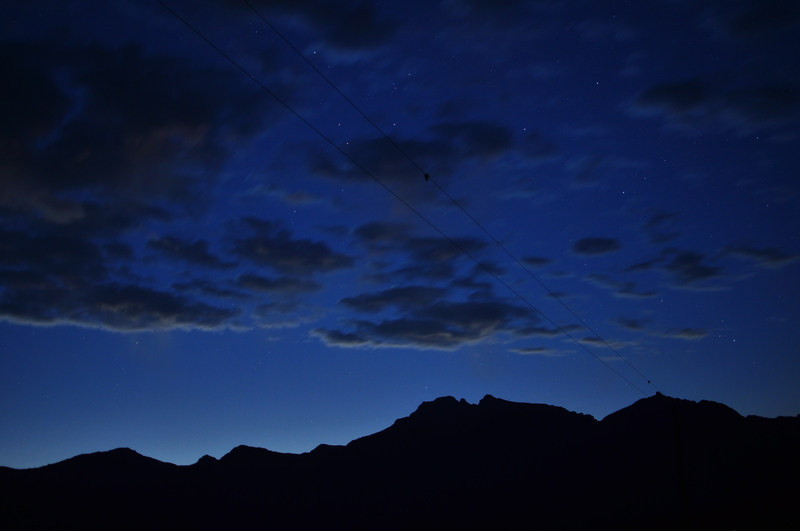 As it was getting dark and I only had one functioning headlight, I stopped at the next rest area for the night. Along the route there, I saw something pink in the horizon up ahead. I couldn’t tell what it was…some kind of unique building? 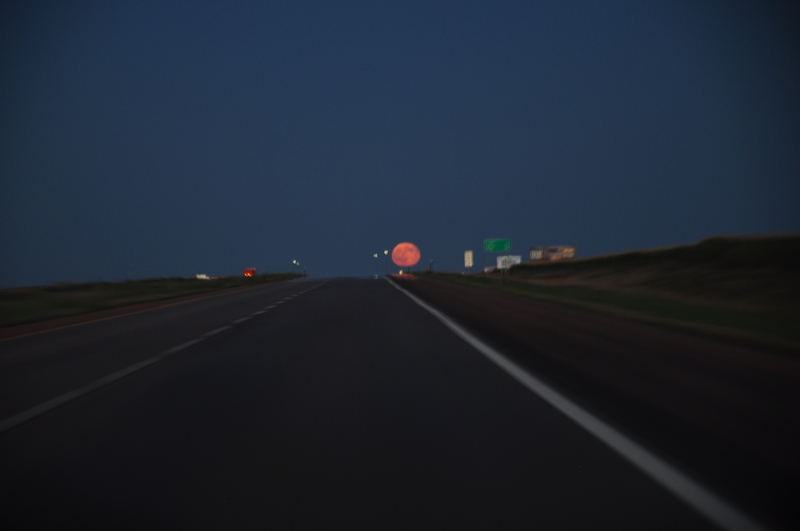 It took me a few minutes to realize “ohhh, it’s the Moon.” The way it lined up, it looked like you could take I-70E straight towards the Moon. I got a good bit of sleep and was on the road by 8AM the next day. I was taking my time and taking advantage of breaks along the way at the Kansas rest stops. I won’t say they are the nicest rest stops I’ve ever seen, but they certainly have the most real estate. In one rest stop I saw enough space where you could have a couple football games going on. 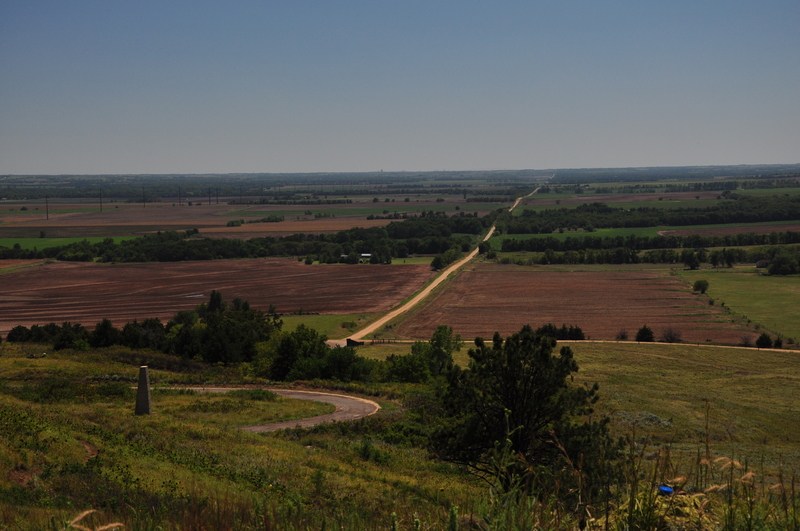 I continued eastwards towards the town of Salina, and there I began the journey south by turning onto I-135. Along the way I stopped at Coronado’s Heights. 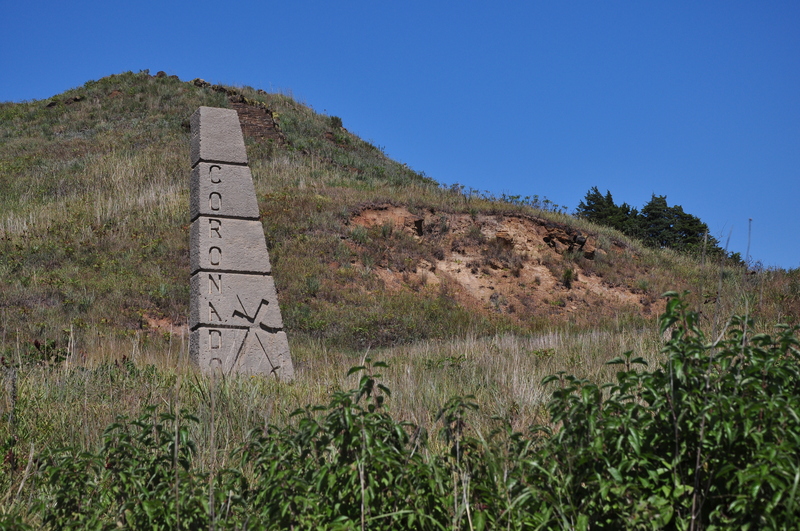 It’s alleged that on this hill (one of the few I saw in Kansas), Franciso Vasquez de Coronodo gave up his search for the fabled “Seven Cities of Gold” and turned around back towards Mexico. There’s no proof of this, it seems, but I was enjoying just thinking about the legend. 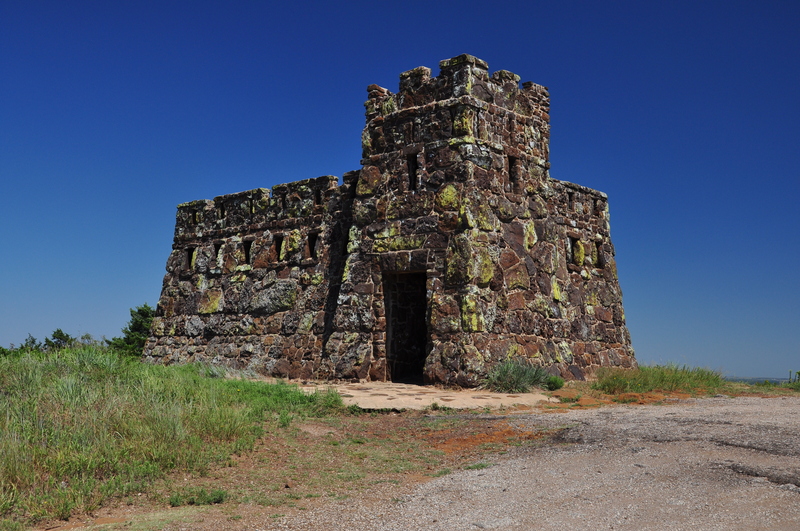 There was a stone shelter built on top of the hill, and I foolishly thought maybe the shelter dates somewhere around the time of the explorers like Coronado. Nope, I’m an idiot…it was built in 1936 as a public works project. The views from the heights were impressive. Although it was a small hill, just a little bit of a rise gives you a good view of the surrounding farmland. At this point I would be remiss to not thank a friend I know online, Danielle. Danielle lives in Kansas, and before I got into the state I had asked her if she had any recommendations of things to see. She went above and beyond and polled some people she knew online. They, in turn, filled out a GoogleDoc full with places of interest along my route. I had plenty of recommendations in no time, and had to pick and choose. 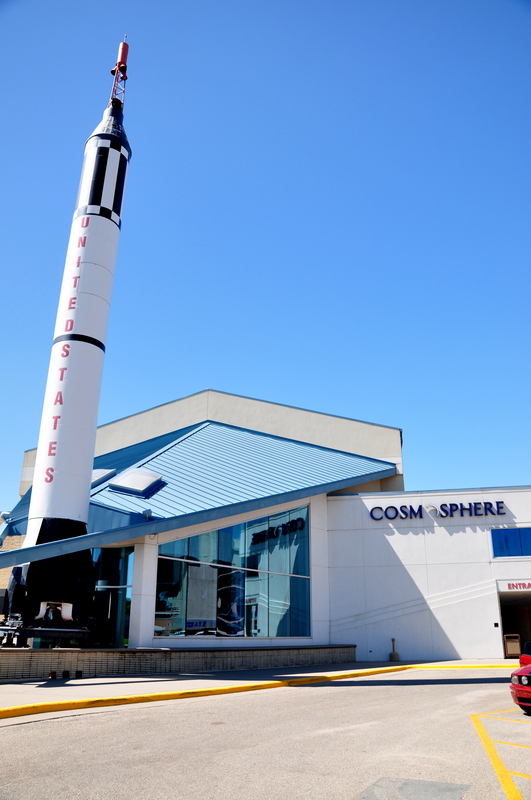 One item listed that piqued my interest was a space museum called the “Cosmosphere.” I’m embarassed I would’ve driven past a pretty major space museum and not even realized it. It was just about 30 minutes off the interstate, and I arrived just after 3PM. And it wasn’t until around 6PM that I left…it was that good. I went to the desk to buy a ticket. Unfortunately, I was just a few minutes late to catch the IMAX film about the Hubble Telesccope, but on the positive side, that meant only $12 for admission to the museum section. The trailer I heard playing through the speakers made it sound like a pretty cool movie (plus it was using music from the movie “Sunshine”, which is never a bad choice). Hopefully I’ll be able to catch this film in some other IMAX elsewhere in the country. I grabbed my ticket and quickly headed towards the main exhibits. 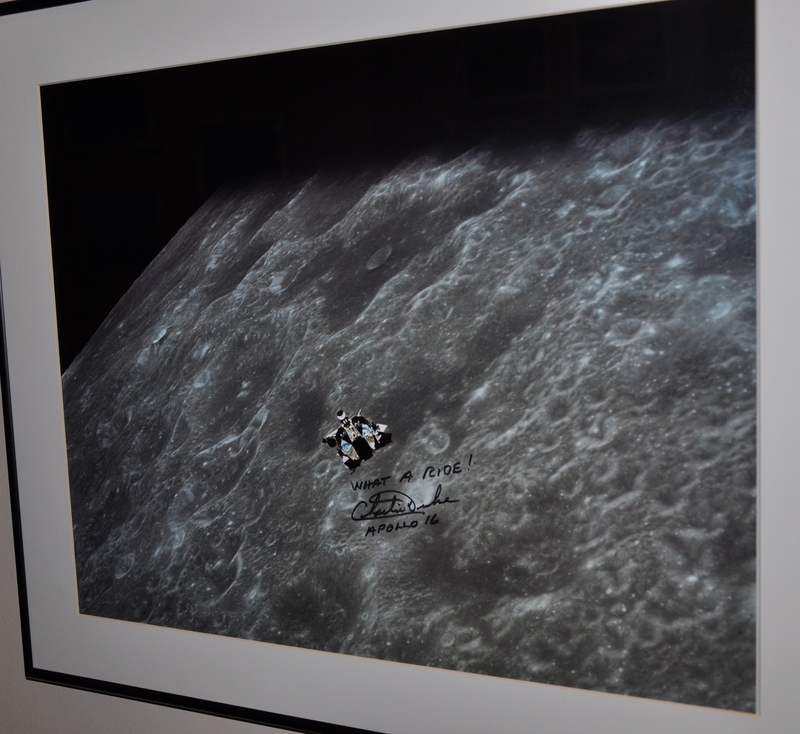 Just before the main entrance to the museum section, there was a big exhibit about Apollo 13, as 2010 marked the 40 year anniversary of the mission. 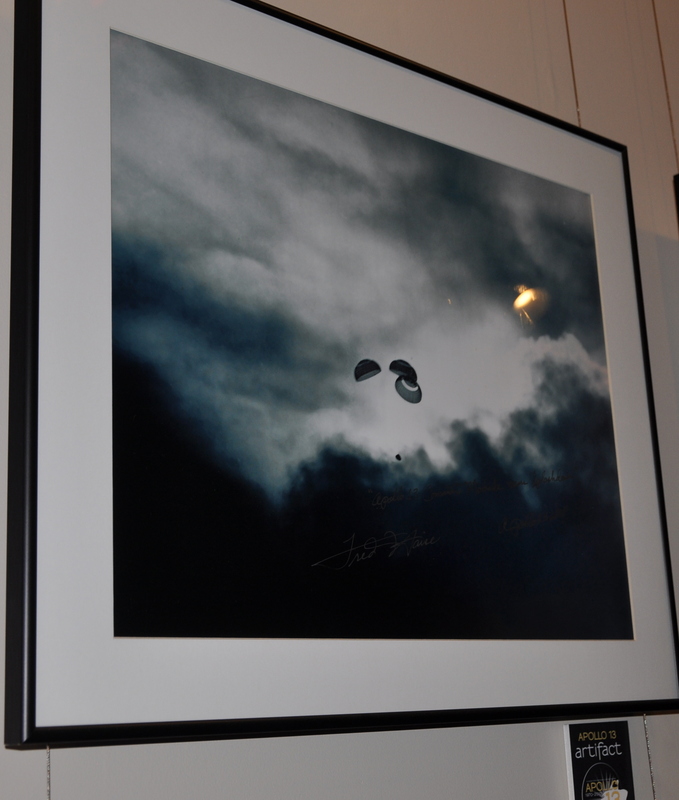 Displayed were pieces of equipment used in the mission, photographs, and personal accounts of NASA employees. 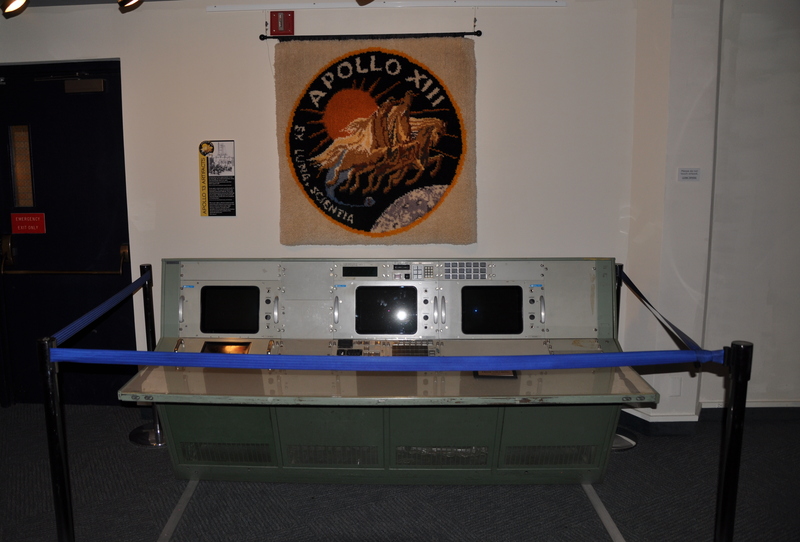 I spent probably 25 minutes looking at the Apollo 13 stuff, and this was even before the official start of the museum. I knew I must be in for something special here. I scanned my ticket, went through the turnstiles, and began my tour. I then stepped into the main section of the museum. I didn’t really know what to expect going in (I hadn’t read the pamphlet), so I was a little confused when I found myself in a gallery about WWII. 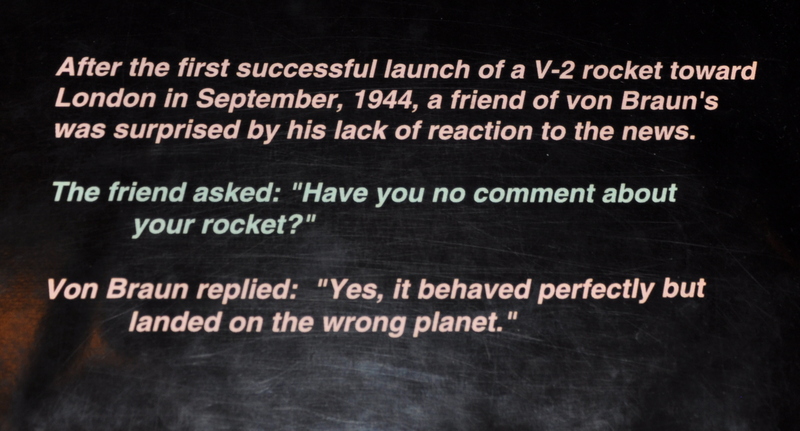 But then after seeing a model rocket hanging and some displays, I realized the museum was going to start from the very beginning – German development of the V2 rocket in the early 1940s. 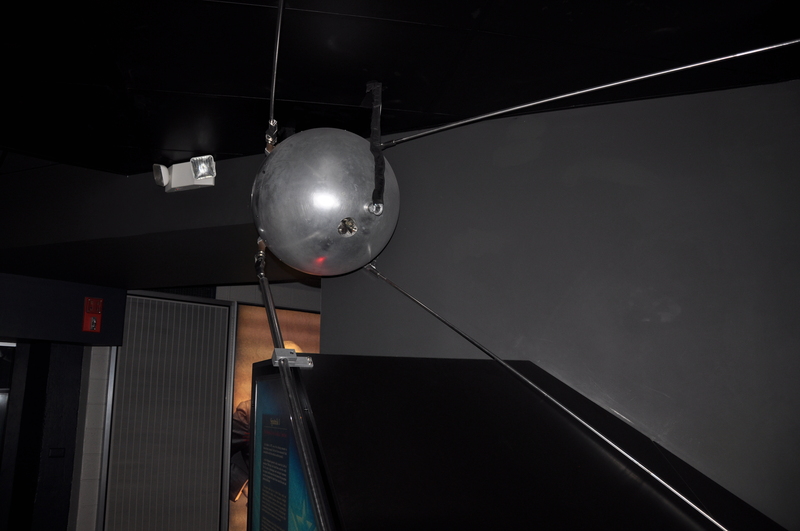 And there were other galleries ordered in chronological fashion – Cold War era, first satellites, etc. 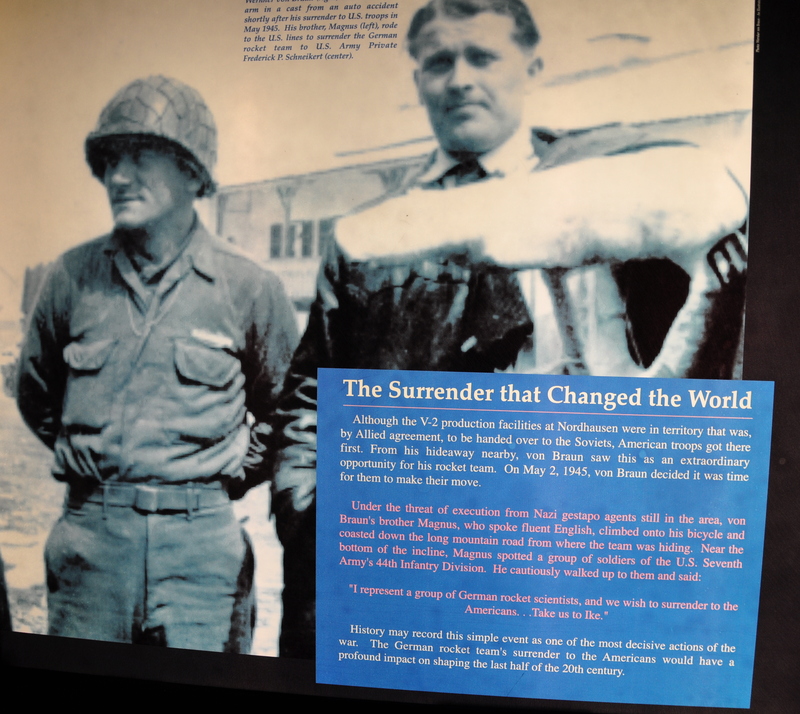 I learned a lot reading each of the displays, and there was a lot of information on Wernher von Braun, the premier rocket engineer of the 20th Century. One of the displays said that thanks to von Braun continuing his work in America, the U.S. saved over $2 Billion (1950s dollars) in rocket R&D. Unreal. I knew this man was a genius, but the more I read the more I realized I’ve underestimated his impact. 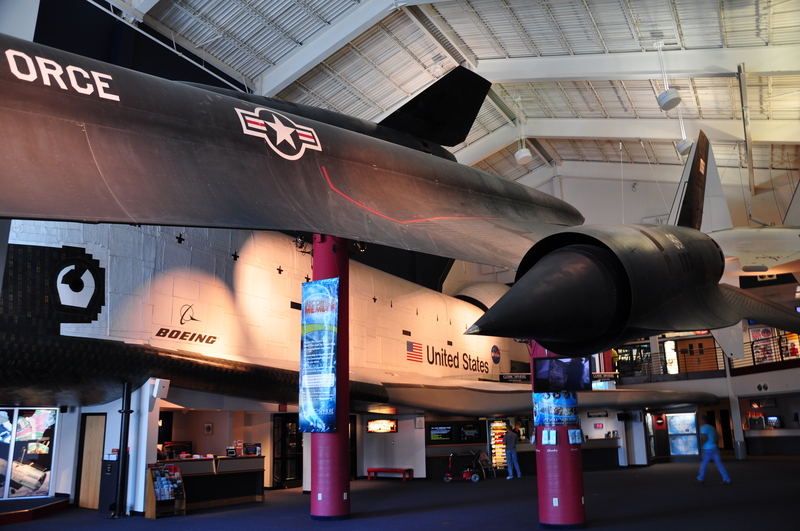 Further into the galleries, the displays discussed the two major players in rocketry on each side – there was von Braun on the American side, and then Sergei Korolev on the Soviet side. Sadly, Korolev was deemed so important by Stalin’s successor, Kruschev, that his identity was kept a secret. He was only known as the “Chief Designer,” and was prohibited from wearing the medals he earned, and was not allowed to be recognized at public functions celebrating his achivements, notably Sputnik and Vostok 1 (which took the first man into space). 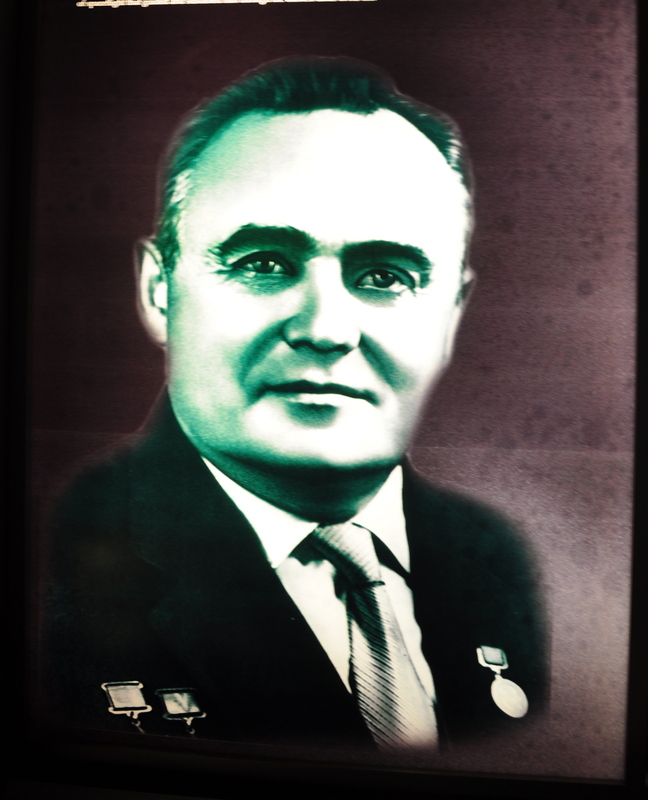 Interestingly enough, Korolev was a former Soviet prisoner forced to work in a gulag for several years, but years later still passionately pushed for the USSR’s cause in rockets and space. 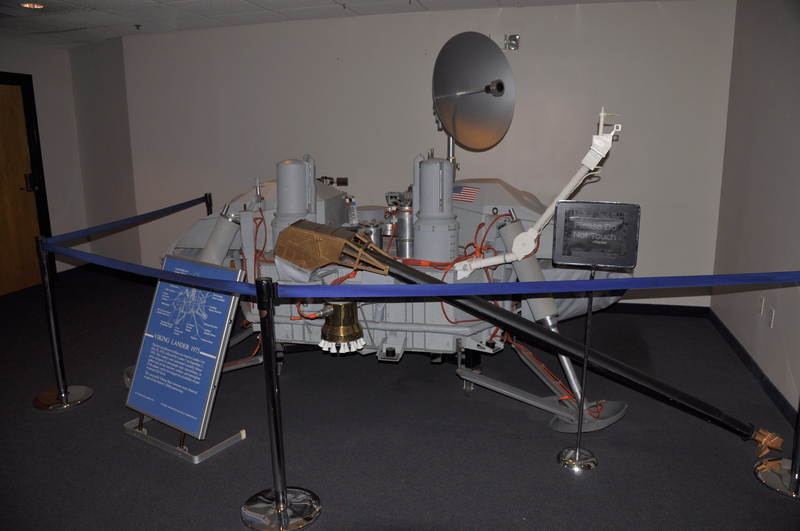 The museum went on in such a fashion, giving great detail about each side in the space race – success, failures, Americans trying to catch up to the Soviets, etc. I won’t bore you with more history…I could probably type for pages about what I learned. I learned that in the 60s, JFK asked his VP, Lyndon Johnson, to put together some recommendations for the US space program. 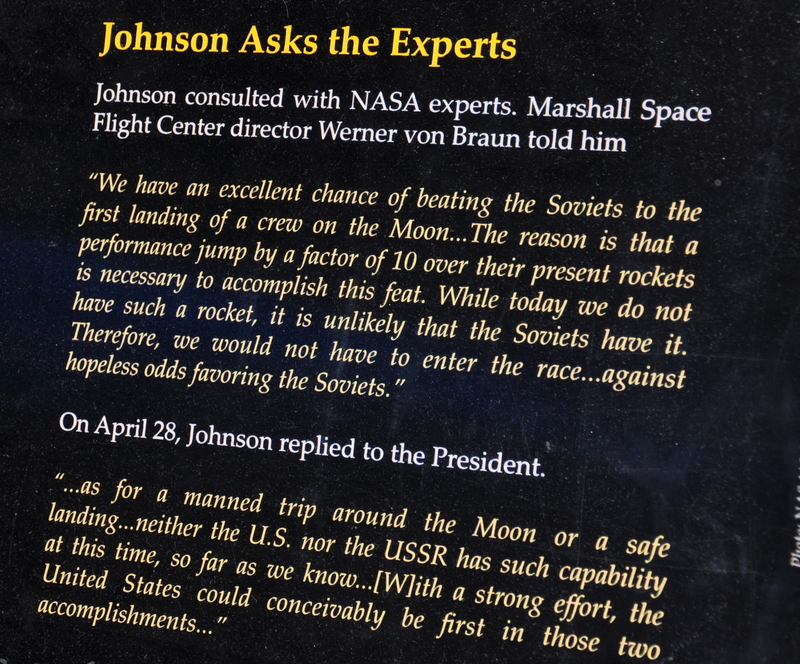 Johnson, after consulting with the experts, was the one who advised that a goal of putting men on the moon was achievable. Just some fascinating history at the museum. I was blown away. 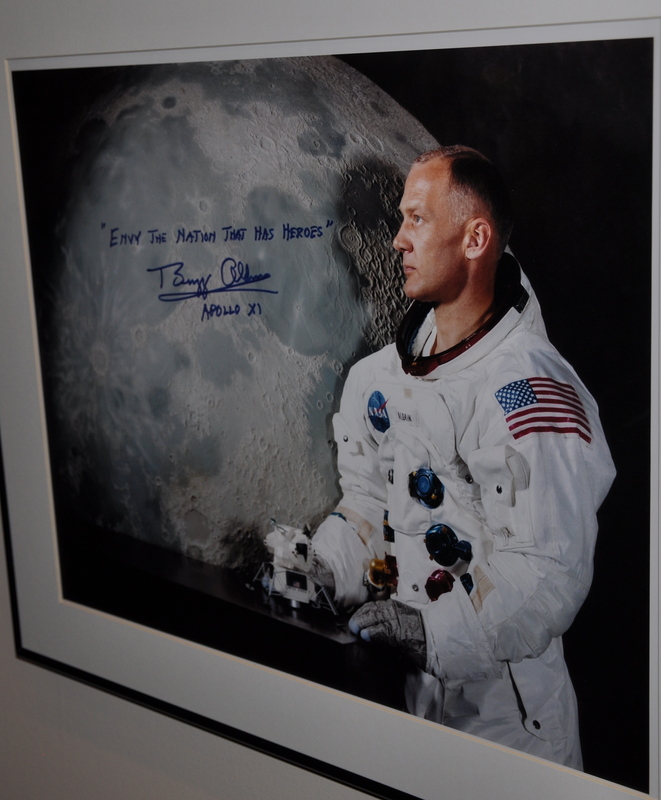 And combine the history with space stuff – just a double whammy. I had learned some of the history in the past, but to understand it better, here, and to hear about the motivations and thinking going on behind the scenes…that was quite an experience. I wholeheartedly recommend the Cosmosphere to anyone within a day’s drive of Kansas. Absolutely remarkable. It was near 6PM when I left…the time in the museum just flew by. I had to make a little more progress before the night came, so I made a beeline back to the interstate. 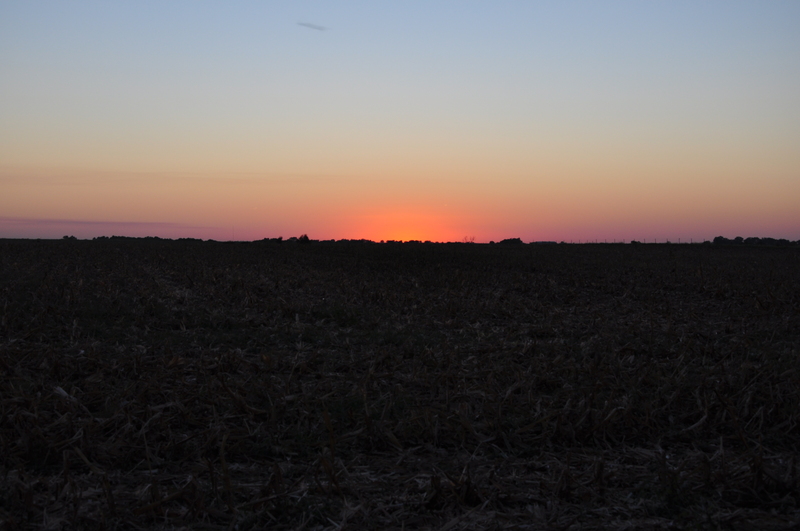 I was able to cross the Kansas/Oklahoma border and it was at a rest stop near Perry that I stopped for the night. 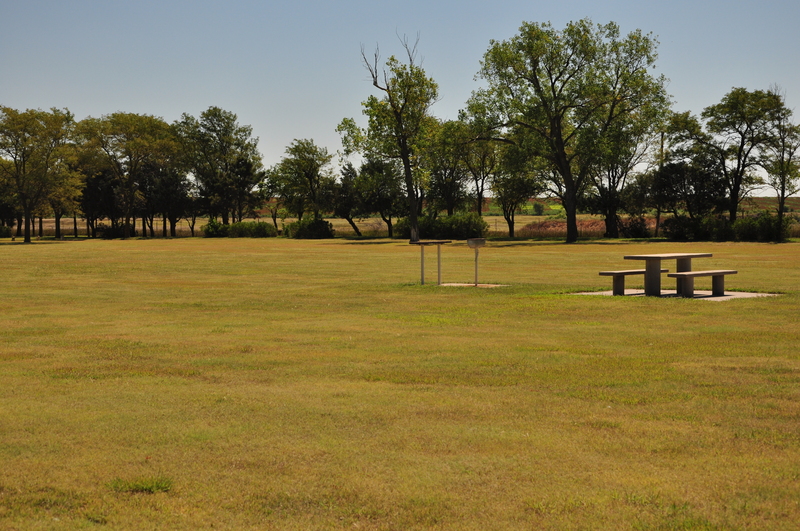 This Oklahoman rest stop did not have as much open land as the Kansas ones, but it had some nice views of the farmland adjacent to the stop. 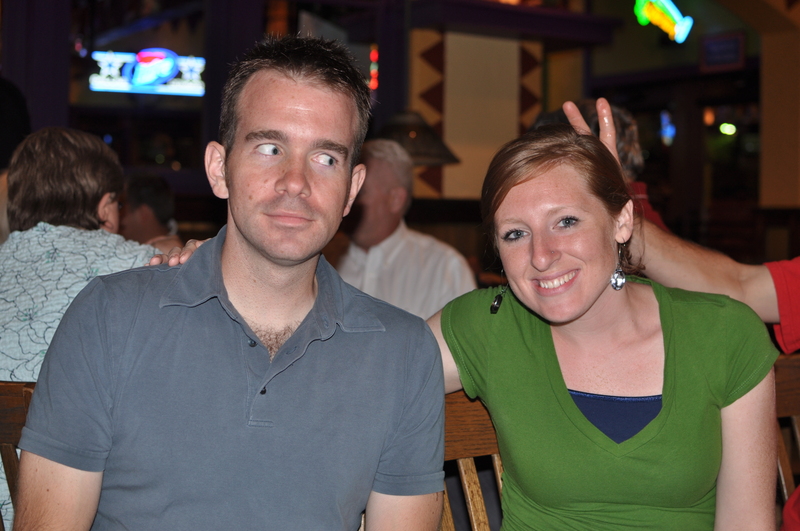 Great times in Kansas. From here the trip somewhat turns back into “people mode,” as I know more folks in this part of the country and further east (where I’m headed). 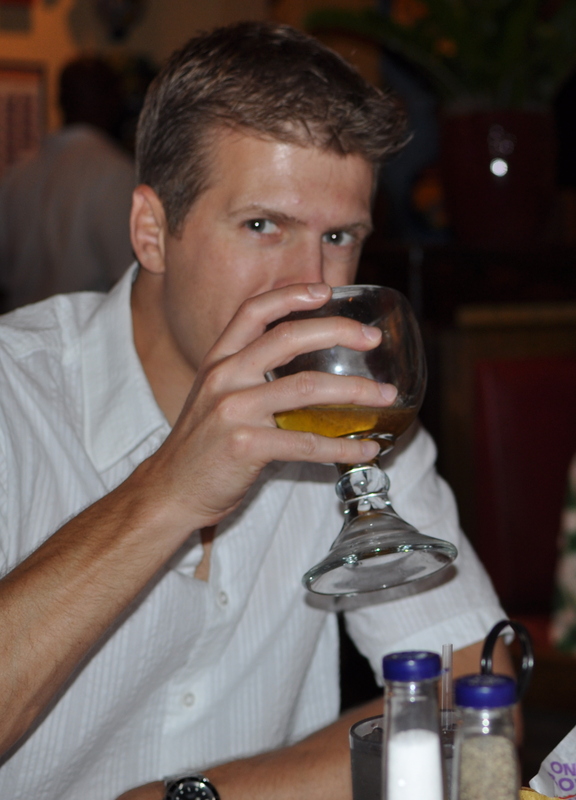 On Friday, I’ll make my way into Texas and re-visit some friends in the Dallas/Fort Worth area over the weekend. The plan is by August 31 to be back in Georgia, the starting point of this roadtrip…but not the end point! That’s still a few thousand miles away. How comfortable it was to wake up in a king-sized bed and not a reclined car seat. It took me a few seconds to remember where I actually was. I am definitely not used to this luxury. This hotel has a pool, so I’ve been taking advantage of that since I’ve been here. Got some early morning exercise swimming, and then by late morning I was out the door to run some errands. I ended up parking by the well-known Pearl St. area in Boulder. I had never been to the place, but had heard a lot about it. The Pearl St. Mall is a big open area, spanning several blocks, with lots of shops, restaurants, and little food kiosks. 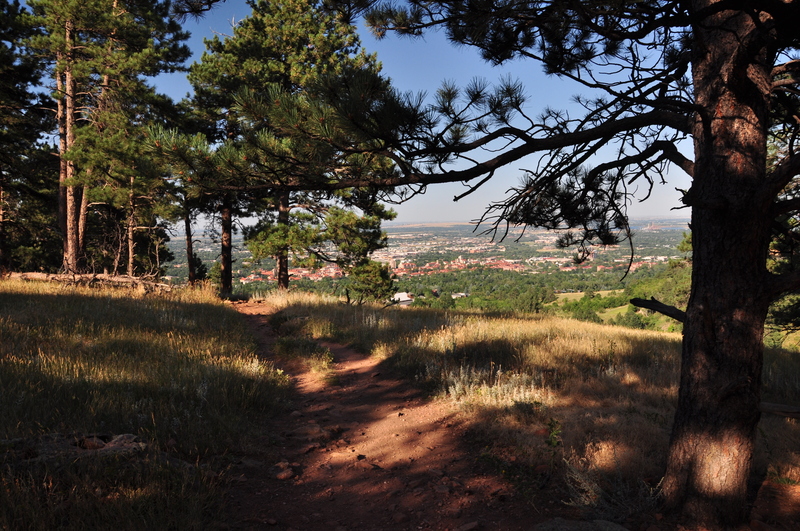 It’s very easy to get around there, and easy as well in the non-Pearl St. areas of Boulder in the vicinity. I was told there would be a lot of street performers on Pearl St., but I didn’t see any. Maybe I was too early. I did see a good number of panhandlers, though (hippie panhandlers are big in Boulder). I have to say I’m kind of sick of seeing panhandlers, especially after a belligerent guy told me, didn’t ask me, to give him some money. I’ve seen a lot of panhandlers on this trip. Too many to count…people holding signs saying down on their luck at street corners….others looking for handouts at stop signs near interstate entrance ramps…others in rest stops (and that guy I just saw eating lunch out of a big cooler before he set up shop). Yes, rest stops. It’s just too difficult to determine who is legitimately struggling, so I avoid them all, and have become more and more distrustful as time has gone by, so I just avoid them. I realize I don’t have some uniquely brilliant insight into the world of panhandling here, but I’ve seen far too many people asking for hand outs to think any of it is real. I got a lot of walking in, probably a couple miles, before heading back to the hotel. 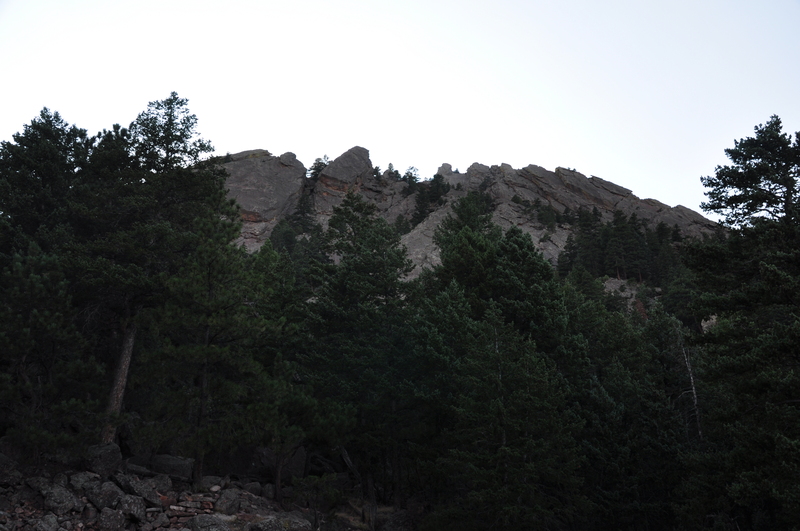 There I met Mike once again, and we headed towards Boulder’s Chautaqua Park near some of the Flatiron Mountains. 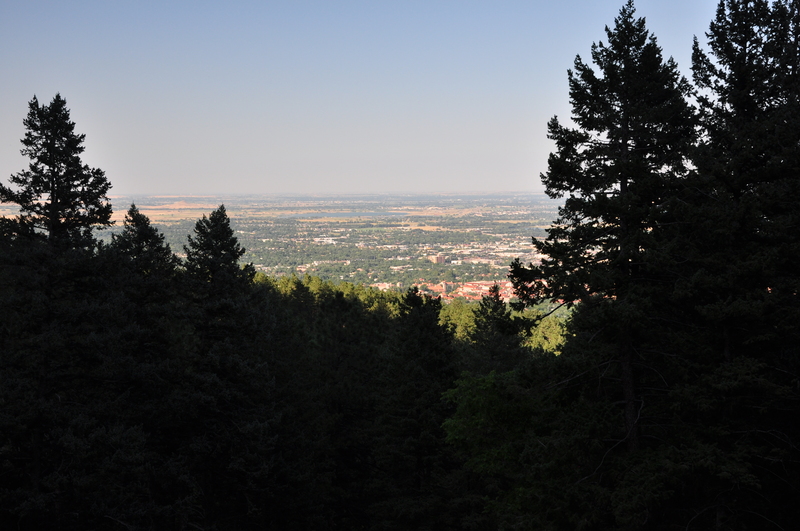 We did a bit of hiking at the park which afforded some good views of the mountains and the city of Boulder, as well. Good times hiking with Mike. Afterwards, we went to grab a bite at a place called “Noodles”, one of Mike’s favorite restaurants around here. 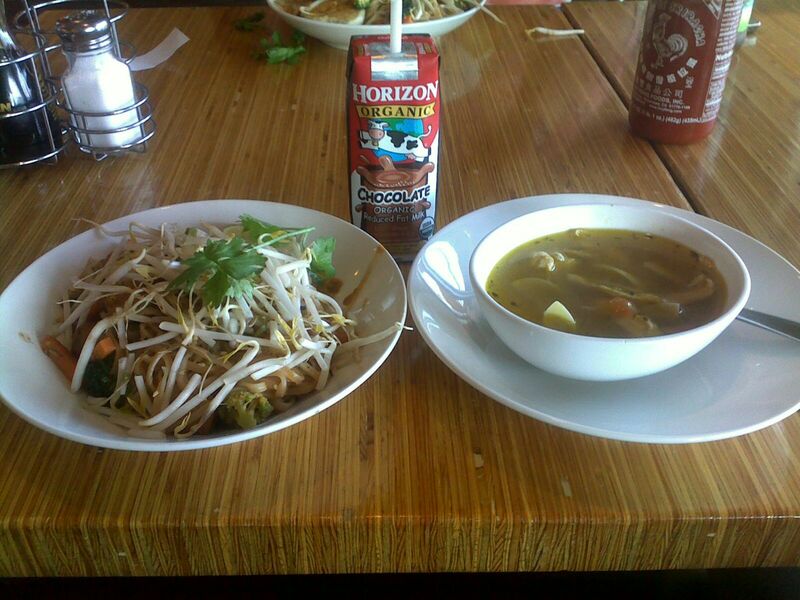 Great meal (and yes John, I added some tofu into the noodle dish). After dinner we headed back to the hotel, and parted ways from there. 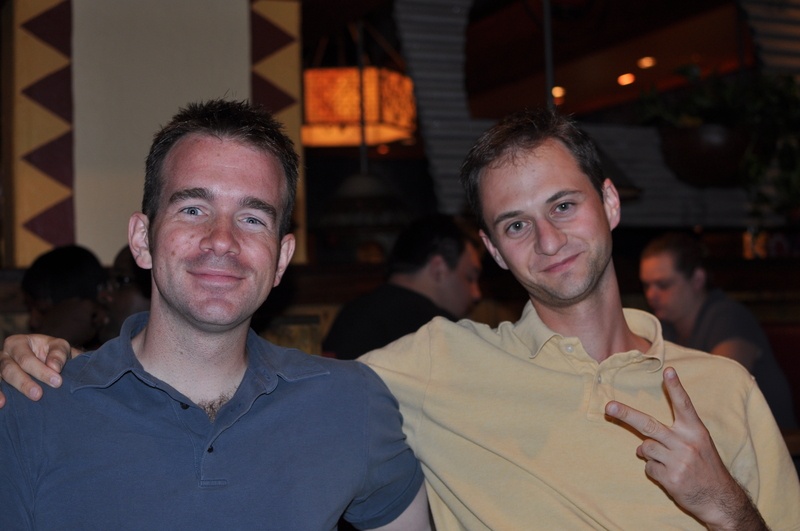 Mike – great hanging with you these past two days. Good luck in school, buddy. I had the rest of the evening to get organized for the next few days of the journey. Wednesday and Thursday will be mostly driving days, as Friday I plan to arrive back in the Dallas/Fort Worth area. 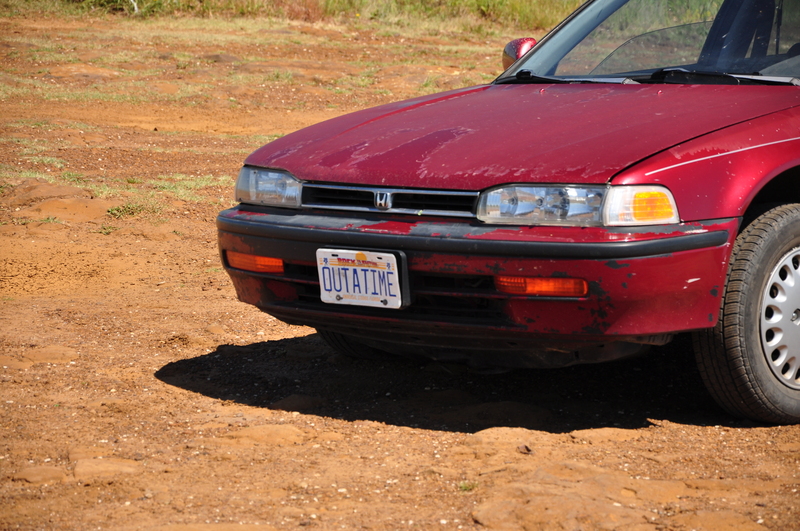 I’m also due for another oil change, so I’ll probably take care of of that here in Boulder before I head out. 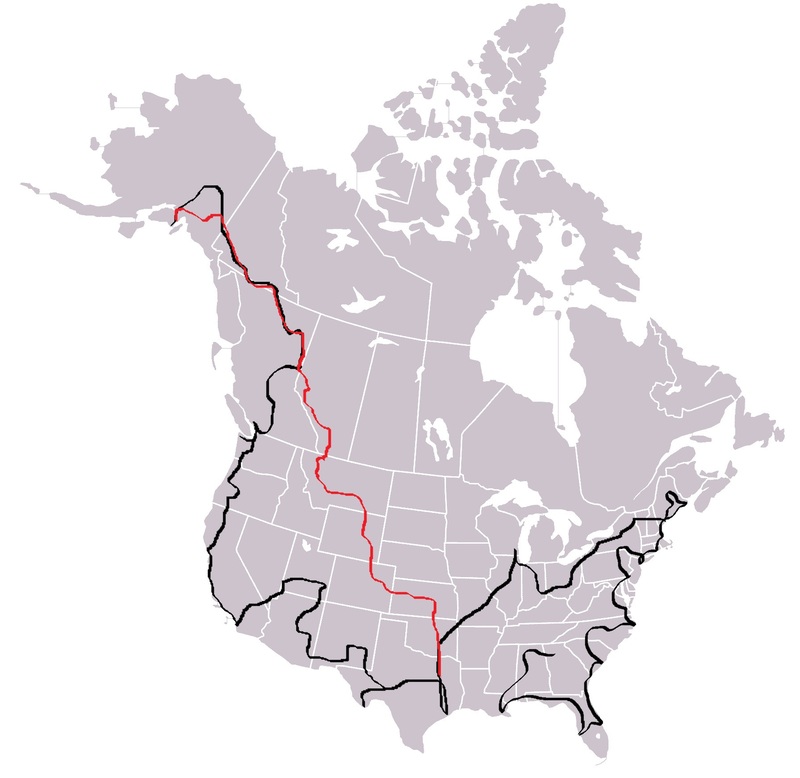 My route will send me east into Kansas (a state I’ve never visited before), and then south. Amazing stay in Colorado. I had a good bit of R&R nearing the 22,000 mile mark on this trip. Thanks once again to John. Woke up refreshed after sleeping at an interstate parking area, which turned out to be a little better than sleeping at a rest area (fewer lights). 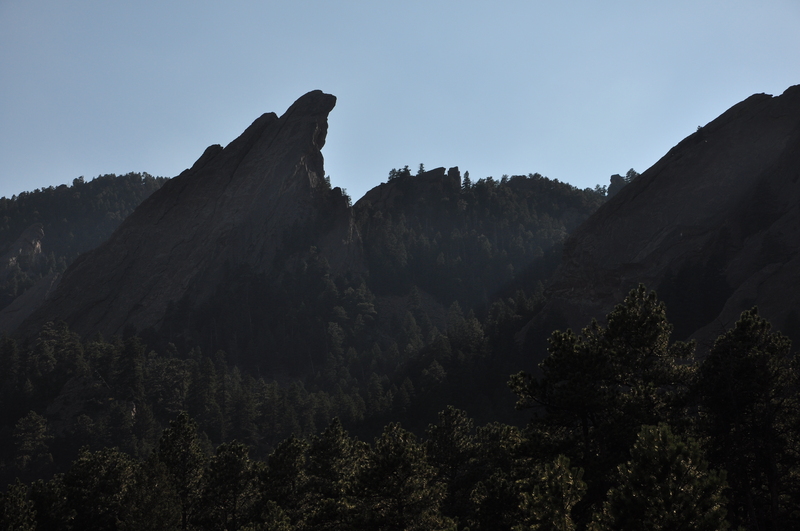 I was also looking forward to a relatively short drive for the day – Boulder was less than four hours away. Along my route, I took a slight detour off of I-25S onto state highway 26. My plan was to check out a historic site there that was on my list to visit since I first started putting this trip together in my head. I was a bit sloppy getting there, though. See, the historic site was just passed a residential area in the town of Guernsey, Wyoming. In my excitement about the destination, I didn’t realize the speed limit dropped to 25mph. Also, I didn’t quite come to a full stop at the stop sign at a four-way intersection. Very sloppy. Before I knew it, an unmarked SUV behind me had its lights flashing. Damn. I thought I was traveling slowly, but the officer had me going 36 in a 25 (not good), in addition to not coming to a full stop at the stop sign. Double whammy. He took my information and went back to his truck. I was thinking worst-case scenario, I’d have two tickets. Ugh. And here I had done so well up to this point – 21,000+ miles without so much being pulled over. That’s almost two years worth of driving. The funny thing I realized sitting there was that Wyoming has got my number. In 2005, on my last cross-country trip, I received three speeding tickets in total – one in Virginia, one in California, and the other, you guessed it, in Wyoming. So here I was, once again, pulled over by a Wyoming police officer. Fortunately, I caught a bit of a break. The officer cited me for failure to stop at the stop sign, which is a $100 fine. He said if he cited me for speeding, the fine would be $160. So not only did he only write me up for just one violation, he chose the violation that was the lesser of two fines. He was friendly and polite, and I thanked him for cutting me a break. Traffic violations and fines were not something I put into the original roadtrip budget…we’ll just label this one under the “miscellaneous” category. 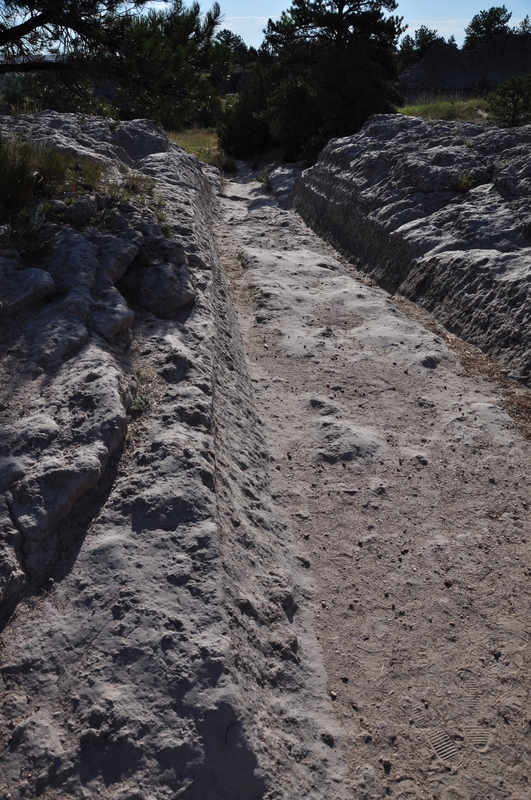 To me, it was one of the coolest historic places I’ve visited on this trip – those are wagon wheel ruts from the mid 1800s. 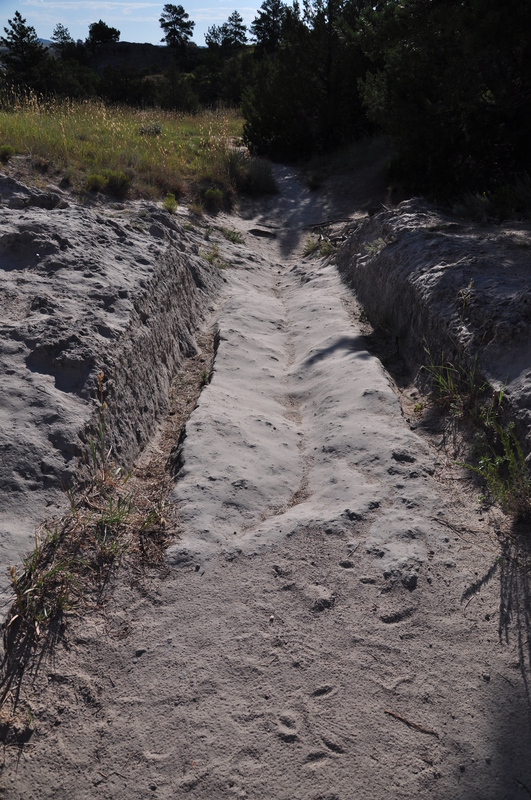 Yes, Oregon Trail ruts. Very cool. 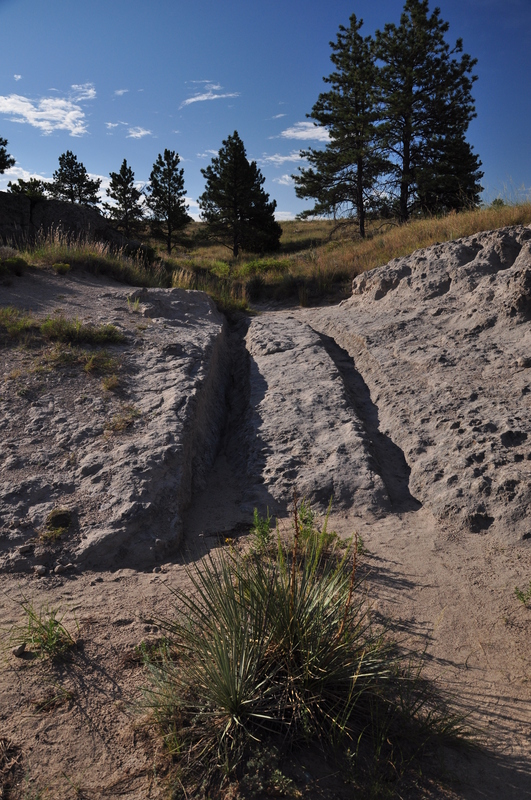 The trails cut by the wheels were preserved in the soft sandstone, and in this area of Wyoming are some of the best preserved ruts on the entire route. Boom, that’s history right in front of your eyes. To me, the time of the pioneers on the Oregon Trail is one of the most fascinating periods of American history. The fact that so much was risked for a new life west, that wasn’t guaranteed to be better, staggers me. I would be remiss to not mention the fact I loved playing the educational computer game “The Oregon Trail” on the Apple IIe computers back in grade school, as many kids born in school during the 80s and early 90s did. Like the real Oregon Trail, the game was fraught with peril as you took your family on the route west. And it never failed that one of your family members in the game would die of dysentery along the way. What a thrill to stand there and walk along the preserved ruts. 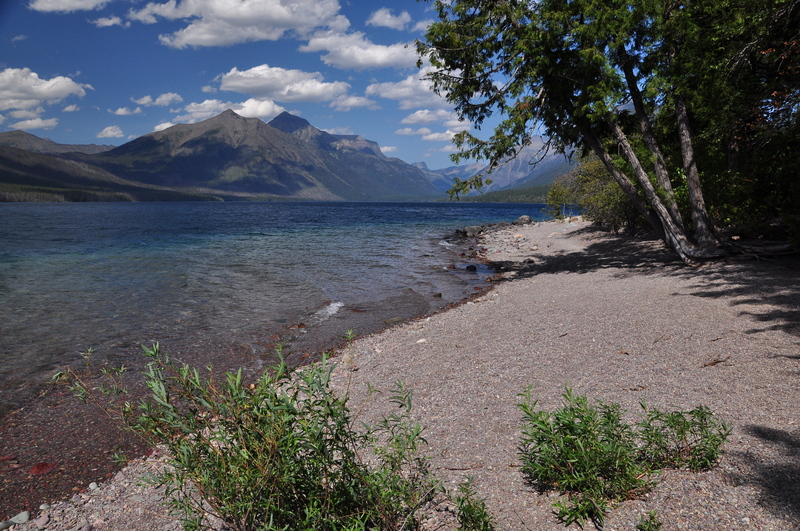 As my friend Matt said, “erosion hasn’t been doing its job there lately,” but I’m certainly grateful for that. Such history. 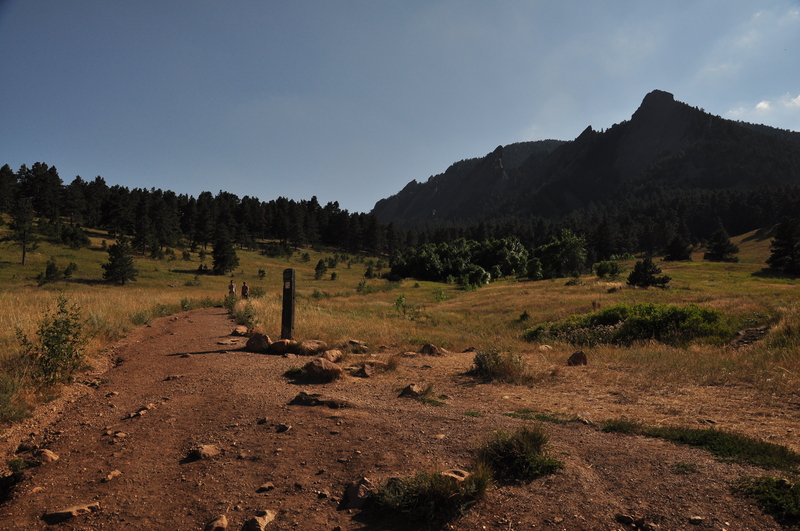 I made my way back towards the interstate heading south once again, and in the early afternoon I arrived in Boulder. My friend John in Georgia (who hosted me while I worked down there) set me up at the Westin hotel. Very generous. I checked into the place, got to my room, and there had a nice view and a king-size bed. To go from car seat to a king size bed is just an unbelievable upgrade. Thanks a lot, John. Later in the day I met up with John’s son, Mike, who just recently moved out to Boulder. 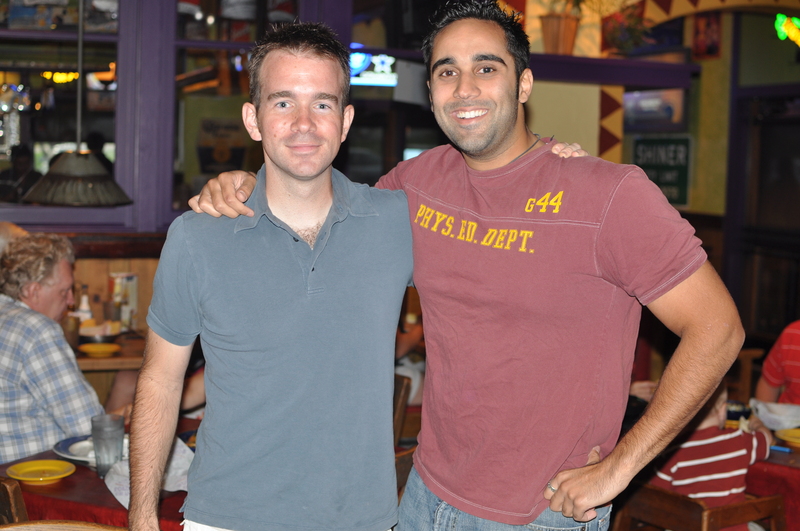 Mike and I lived under the same roof for those six months in Georgia and got along well (we shared a mutual passion for the TV shows “Scrubs” and “Mystery Science Theatre 3000”). 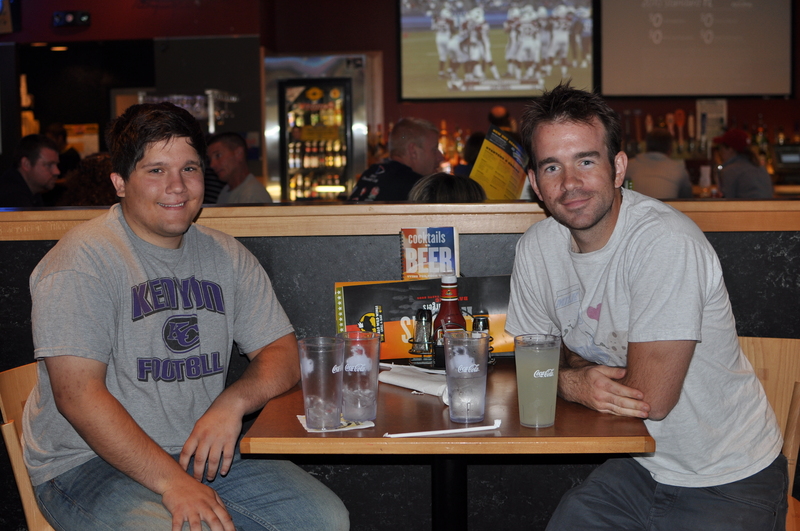 We got together for a bite, grabbed some wings at a Buffalo Wild Wings, and had a good time catching up. 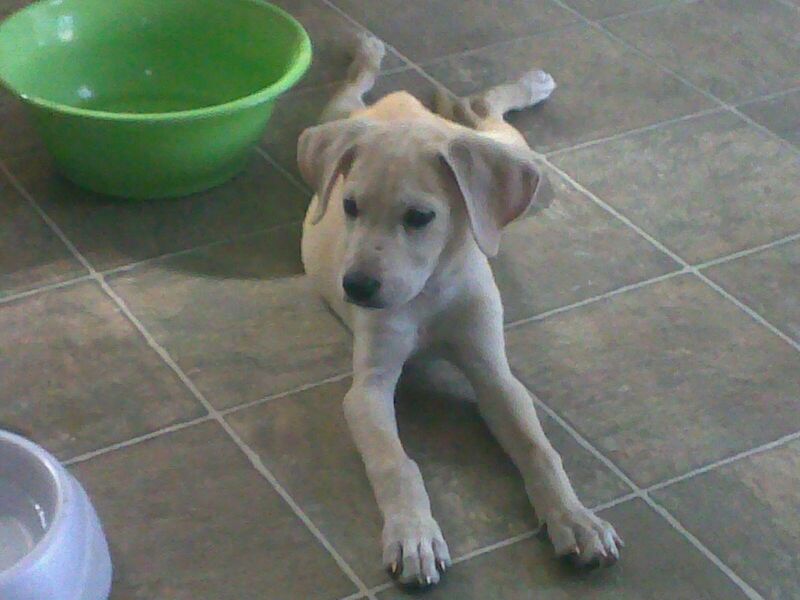 I’ll hang out with Mike again while I’m still in the area, and looks like I’ll have a hiking buddy once again. 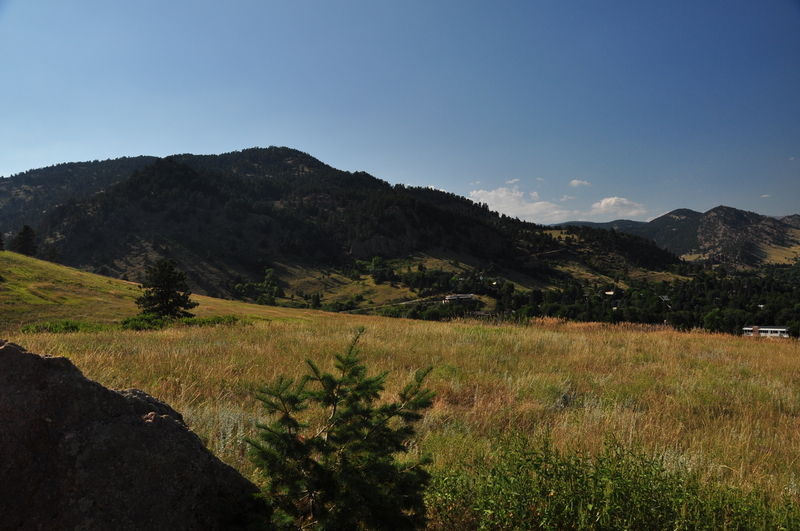 Looking forward to the remainder of a comfortable stay in Boulder. 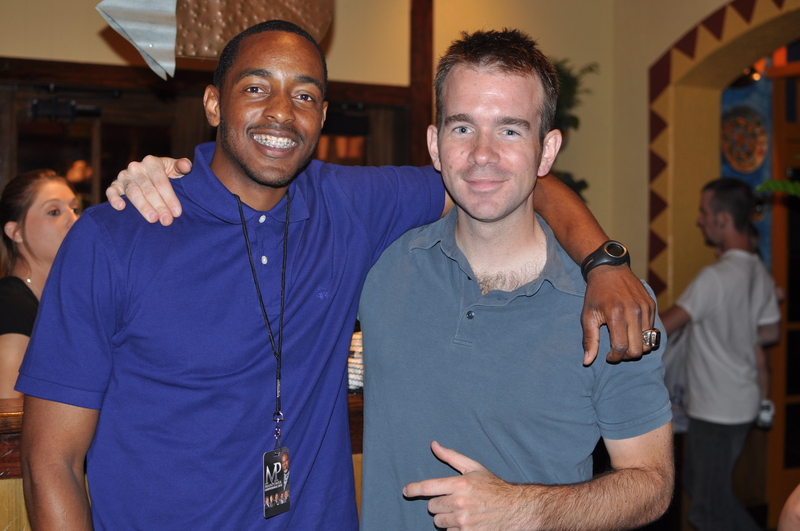 Thanks again, John – a guy who has been overwhelmingly generous to me since the days of CYO basketball some 16 years ago or so. 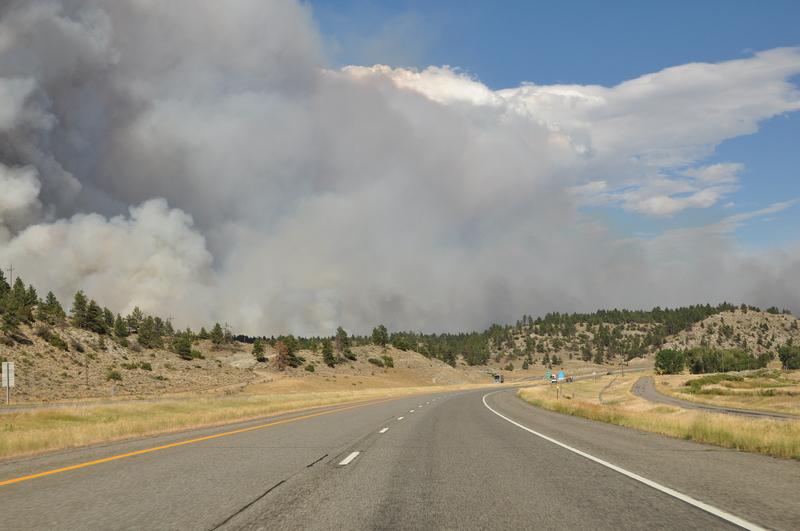 I was on the road towards Billings by the early afternoon, taking I-90E, and was thrilled to be back driving on the interstates. There’s something to be said about rest areas with grass, running water, and regular bathrooms (as opposed to the little outhouses along Canadian highways). Not that I minded those, but the US Interstate System offers a few more amenities. 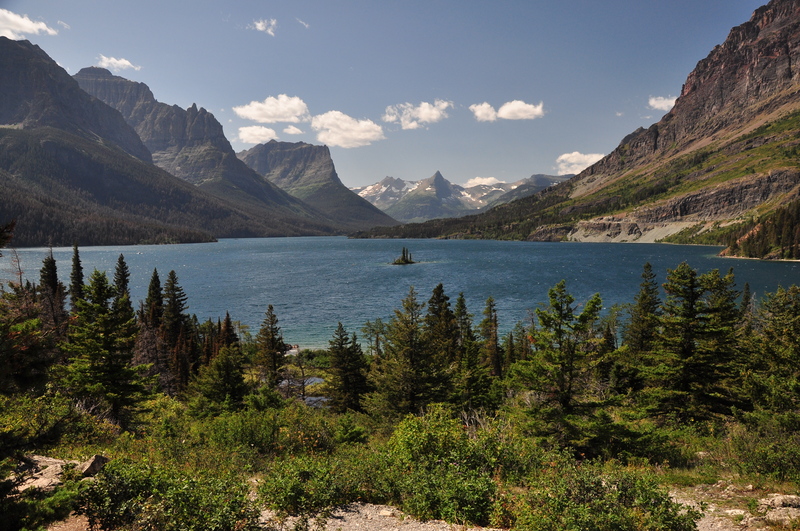 Also, what a thrill to be driving again in beautiful Montana. It’s been five years since I’ve been here last, and I had forgotten how scenic it could be. So I presumed it must be a forest fire. 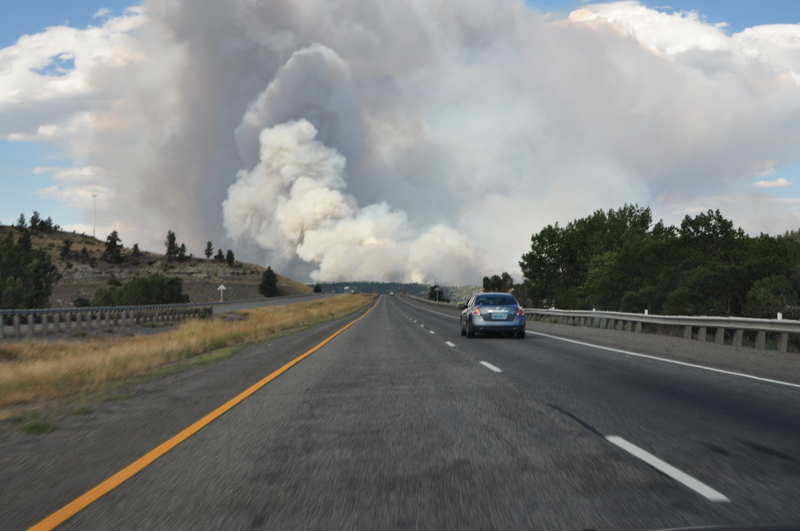 My route along I-90 brought me closer and closer to the source of the smoke. 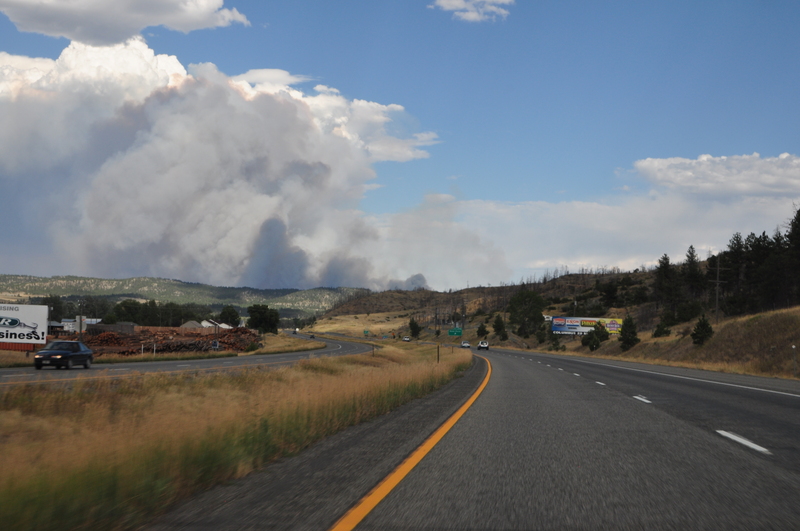 I was wondering how close my route would take me to the fire, as I seemed to be getting closer and closer to the smoke. 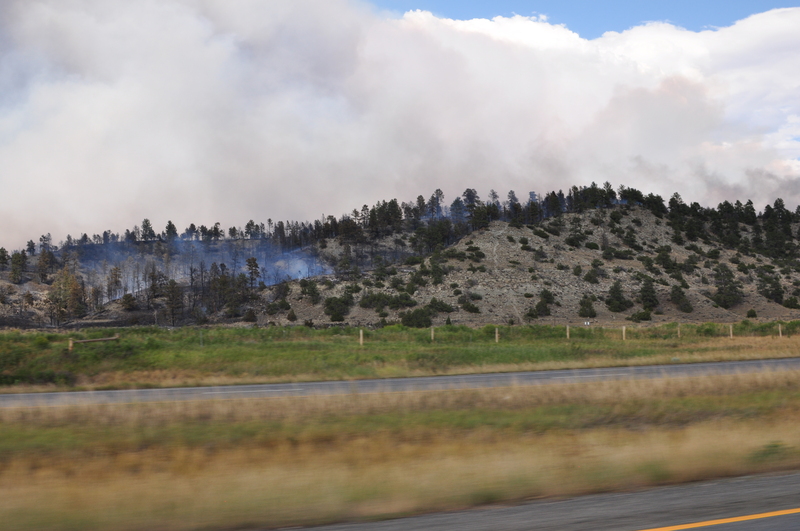 Turns out, I wasn’t that far, maybe a couple hundred yards removed from some recently extinguised fires. I saw a couple helicopters carrying those big buckets of water back and forth. So as you can tell, this fire seemed pretty bad. 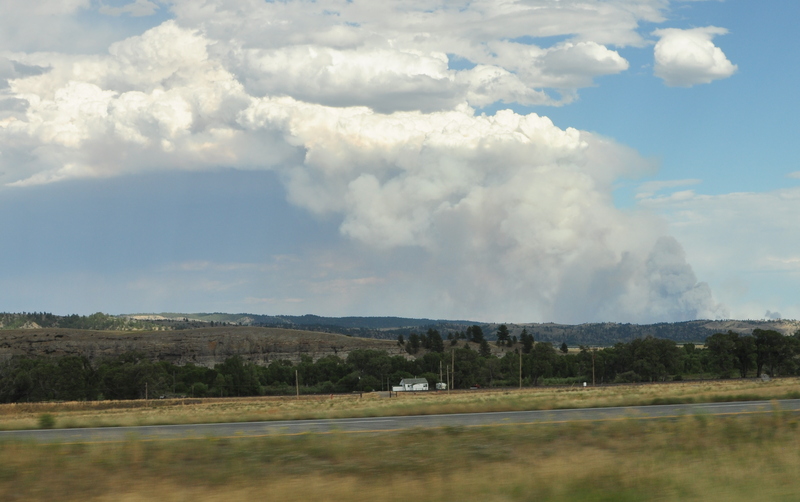 But when I searched online later, I couldn’t find mention of Montana forest fires, so I’m not sure if this was a naturally-caused one or manmade. 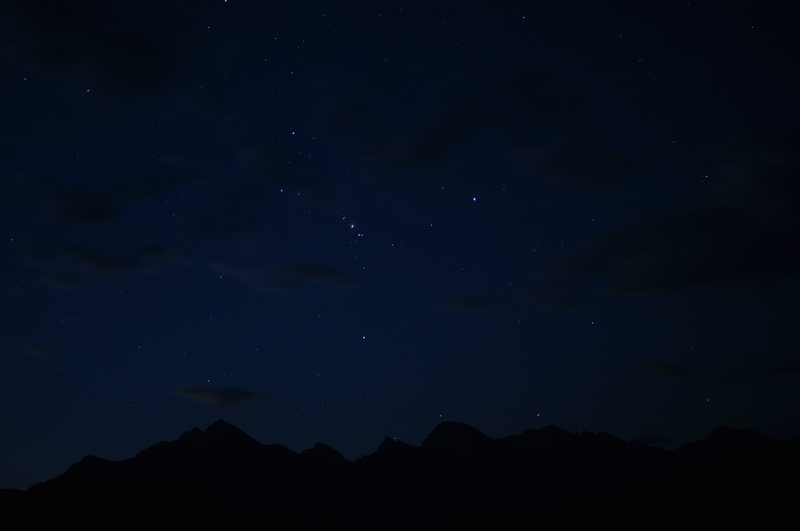 I ended up stopping at a rest stop outside of Billings for the night. It was a hot night, in the 90s; quite a change from those nights in the 40s in Canada. I woke up on Sunday as the sun was rising, and went to fill one of my water bottles, but the rest stop has warnings saying the water was not fit for human consumption. A Canadian truck driver saw me walking with the empty bottle, and gave me three of his own. So generous. Truckers are great. We had a good talk about travels across the US and Canada, and he said his goal is to get to Alaska. I told him it’s a must, especially considering the distances he’s used to driving. 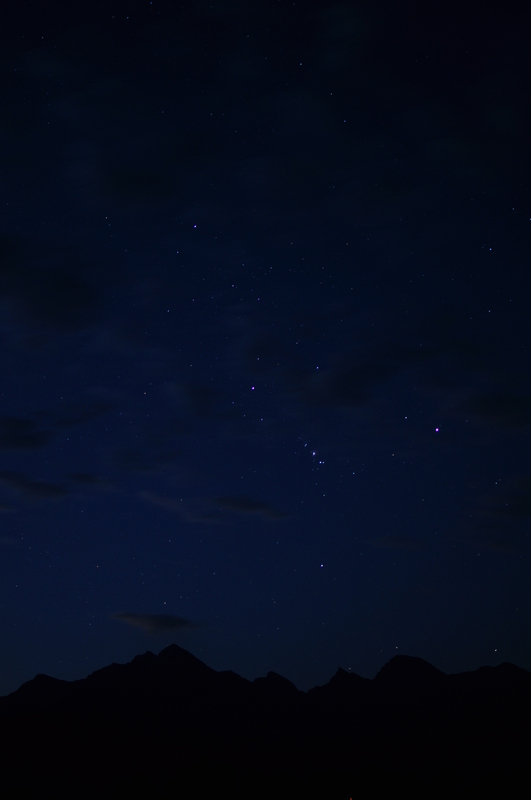 We also shared an affinity for Utah. Funny thing, he said Texas was his least-favorite state, and mentioned New Yorkers keep their noses up in the air (I don’t think he had seen my license plate up to that point). But still, a very friendly guy. 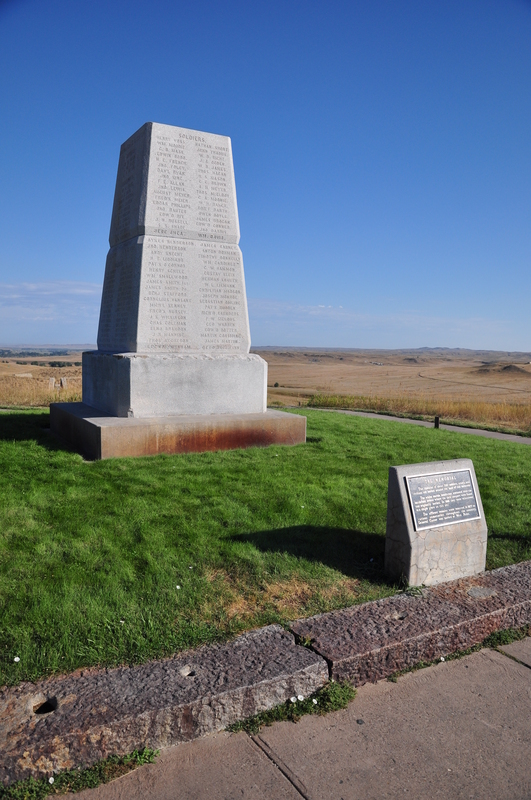 I had always wanted to visited the Little Bighorn battlefield in Montana, but I totally forgot about it when I hit the road back in May. But my road atlas conveniently marks places of interest, and I noticed the battlefield was right on my way to Wyoming. 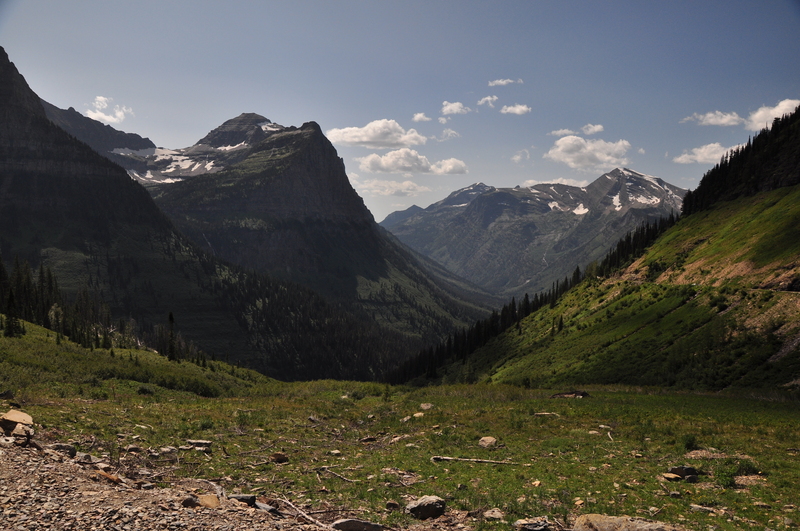 I arrived there as it was just opening, and once again, my national parks pass came in handy (thanks Kelly). 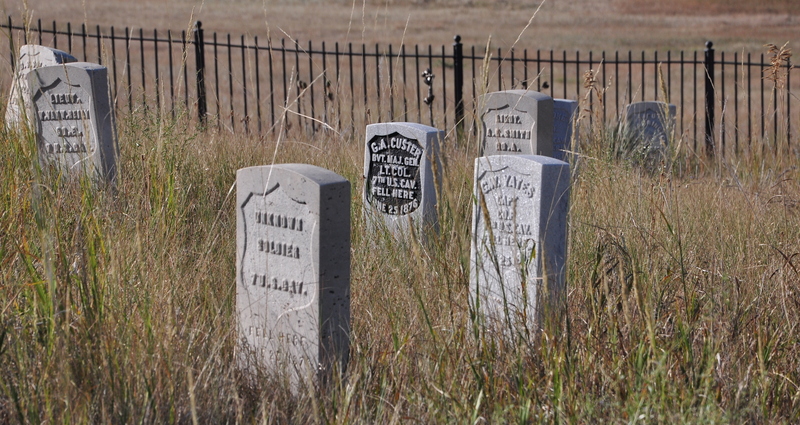 Little Bighorn Battlefield is a national monument, and as you may recall, my parks pass covers entrance fees to both parks and national monuments. Clutch. I was in time to catch a video orientation on the area and the battle that occured in June of 1876. 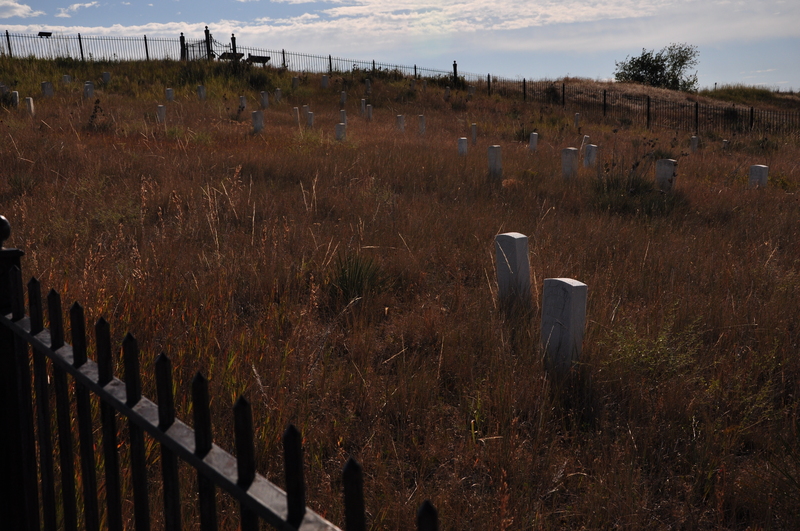 My knowledge of the battle and Custer’s Last Stand was pretty spotty, so it was good to learn again. Checking out the battlefield after the video, I realized how quickly Custer and his men would be at a disadvantage, with the undulating hills and ridges. 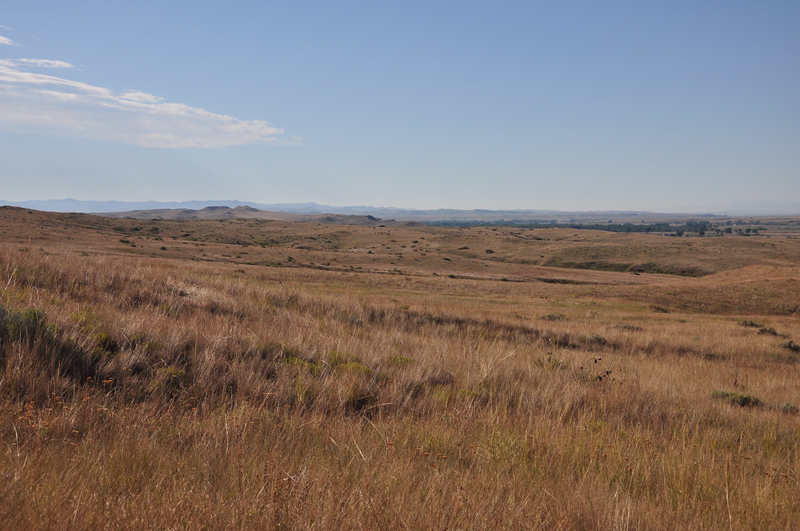 Sitting Bull and his allies were quite familiar with this land, and it wasn’t hard to see why the battle turned out to be a massacre. Also, communication between Custer and his various companies spread out wasn’t smooth, and the lack of coordination ultimately led to Custer’s demise (not to mention, according to high estimates, it was his force of 600 vs about 2,000). 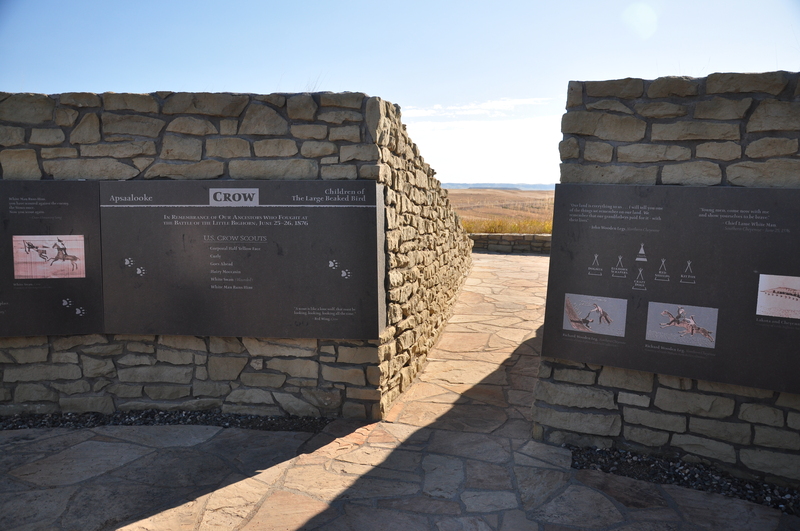 There was also a memorial there built for the Native Americans who fought at Little Bighorn. It was a circle, with displays on each of the major communities that fought on the side of the Natives Americans. 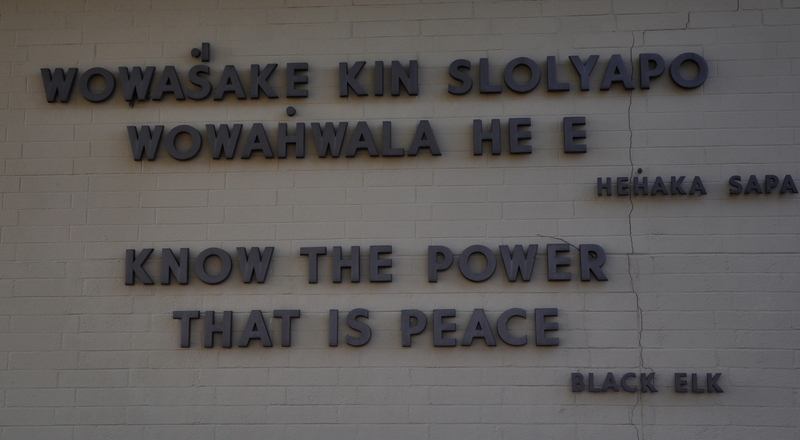 Very powerful and moving memorial. I was glad I made the stop at the battlefield. It was a good history lesson, and a moving experience. I pressed on further south, towards Wyoming. 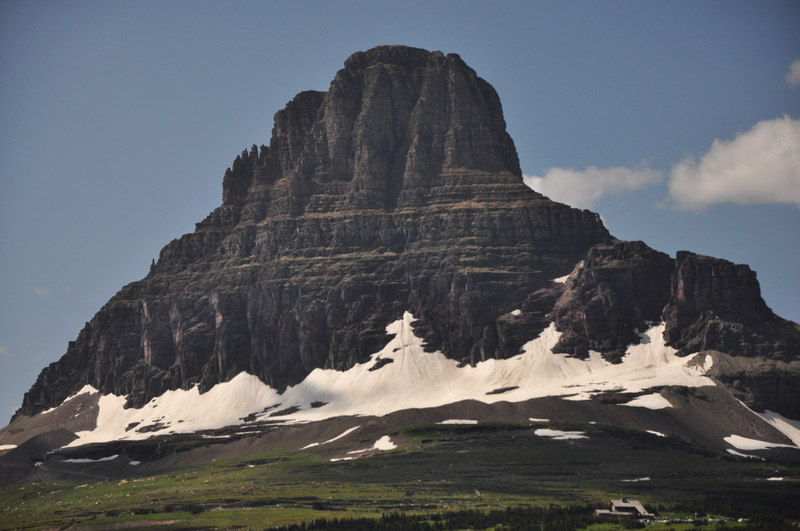 The driving was scenic, and uneventful, and I stopped at an information center in Wyoming to have some lunch. 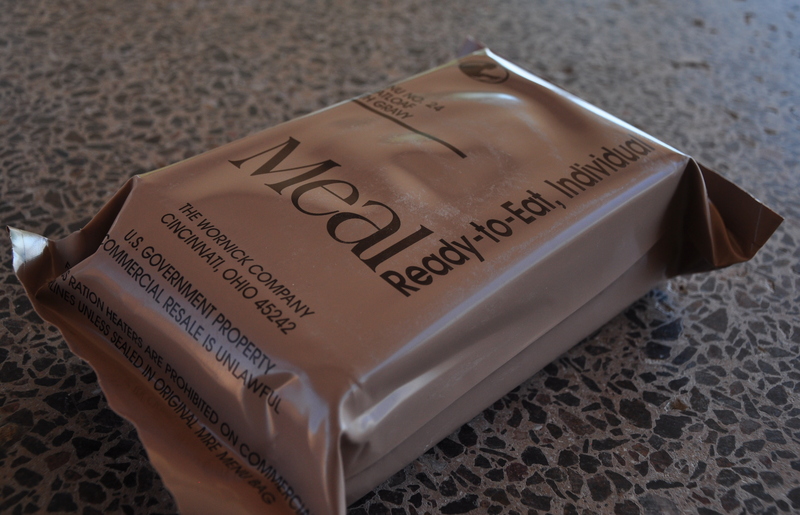 I had forgotten my brother Mike gave me some military MREs (Meals Ready to Eat), so it was time to try one. 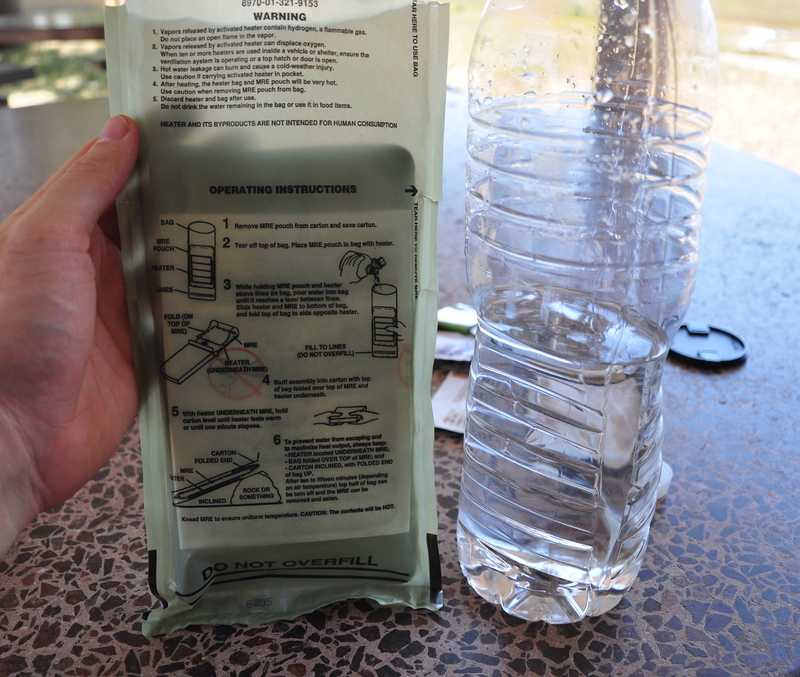 For those not familiar with MREs (as I wasn’t), it’s a pretty cool system. Check out the pictures below to see how it works. So I stuffed my meatloaf in the bag, poured in the water, then let the package sit for about 12 minutes or so. I was anxious to see if I did everything correctly, and turns out I did. Pulled out a warm package of meatloaf. 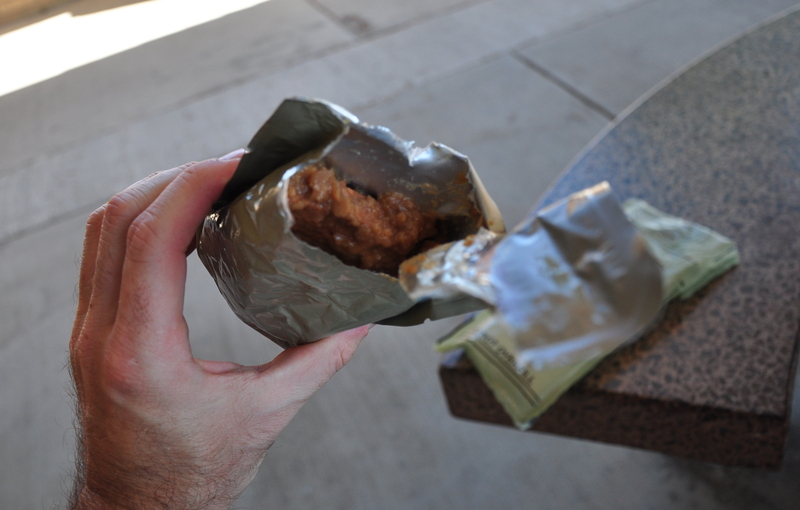 My first experience eating MRE was a very positive one – I thought the meatloaf was delicious. I didn’t heat up the mashed potatotes, as the meatloaf, cracker, cookies, and tootsie rolls filled me up. 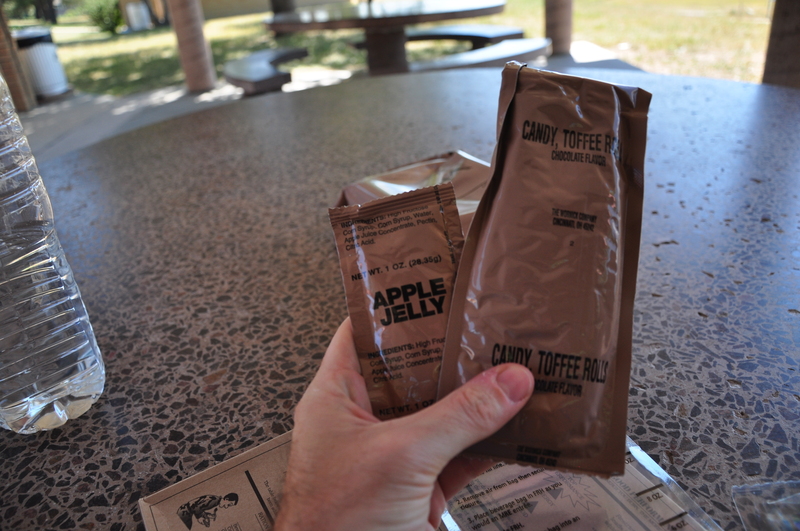 Can’t wait to try my other flavor of MREs later in this trip. Thanks again, Mike. 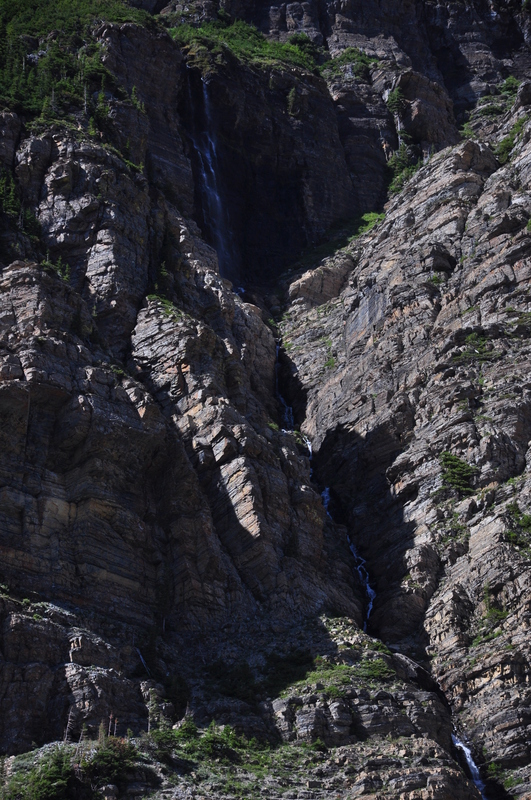 After lunch, I continued my drive into the heart of Wyoming. I stopped in the town of Casper. 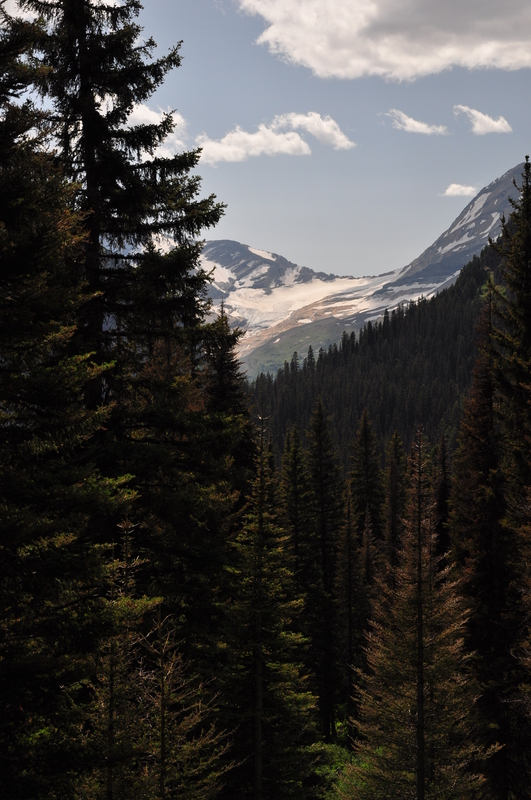 I’ll sleep here for the night, and come Monday, I only have about four hours from here to my hotel in Boulder. Looking forward to having a bed to sleep in once again. Haven’t been in a bed since I was staying in Palmer, Alaska.